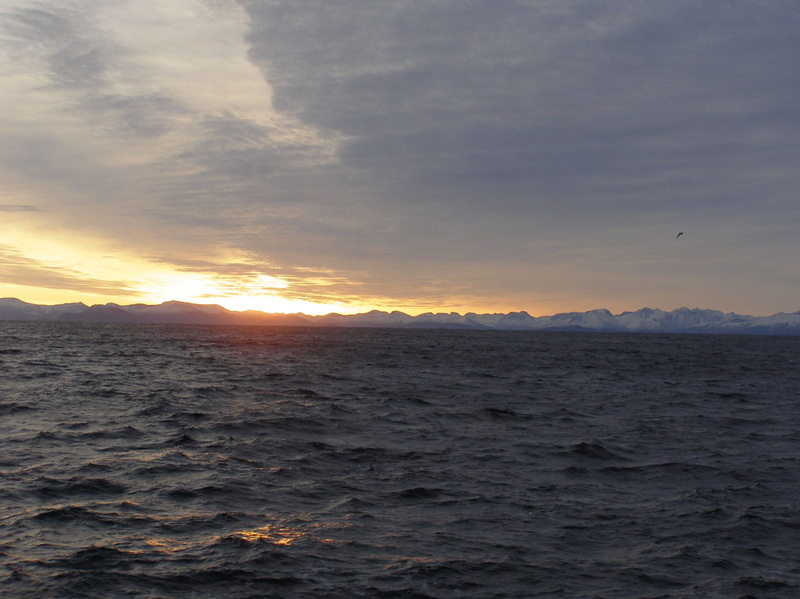 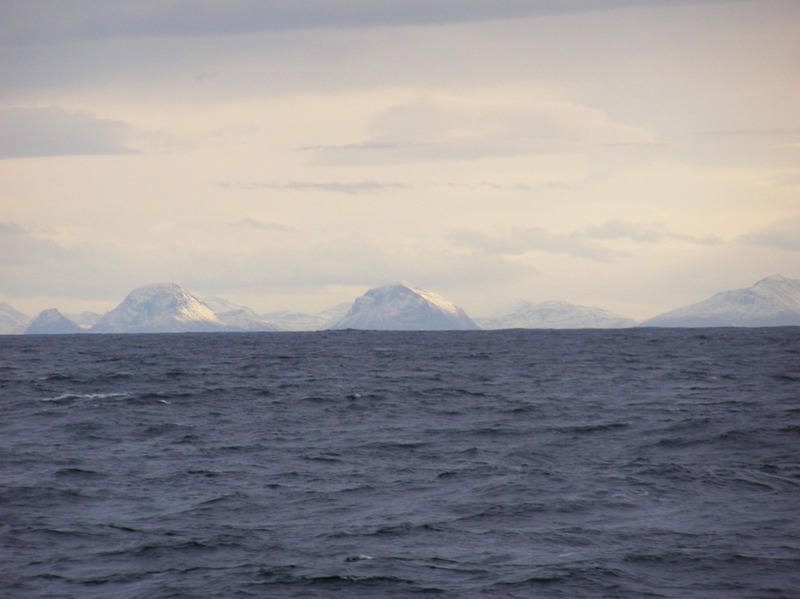 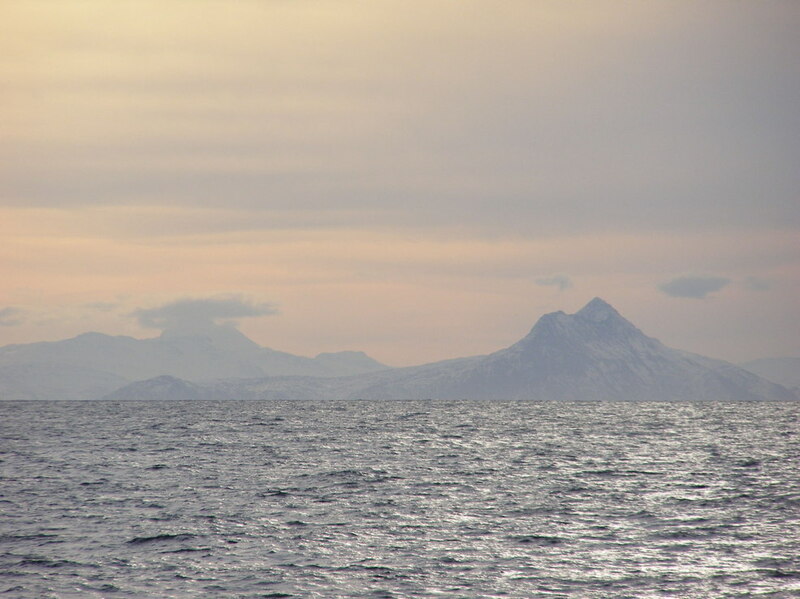 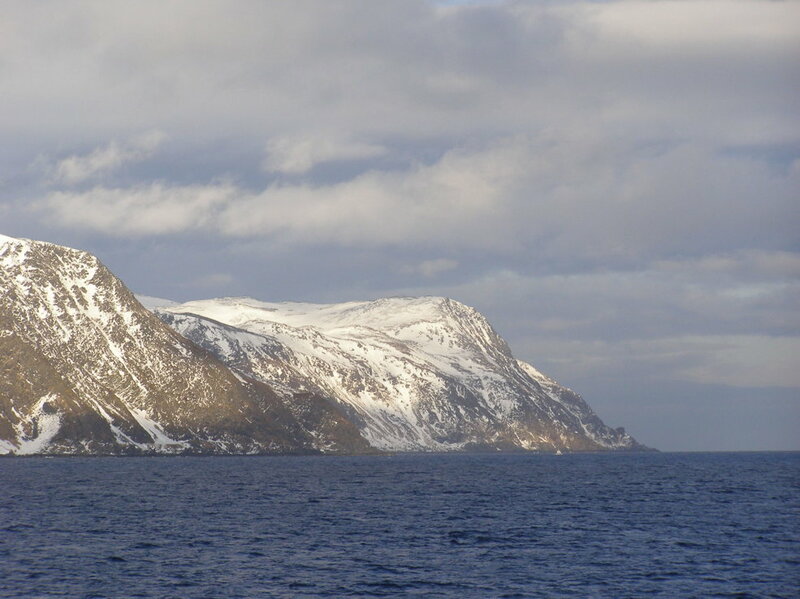 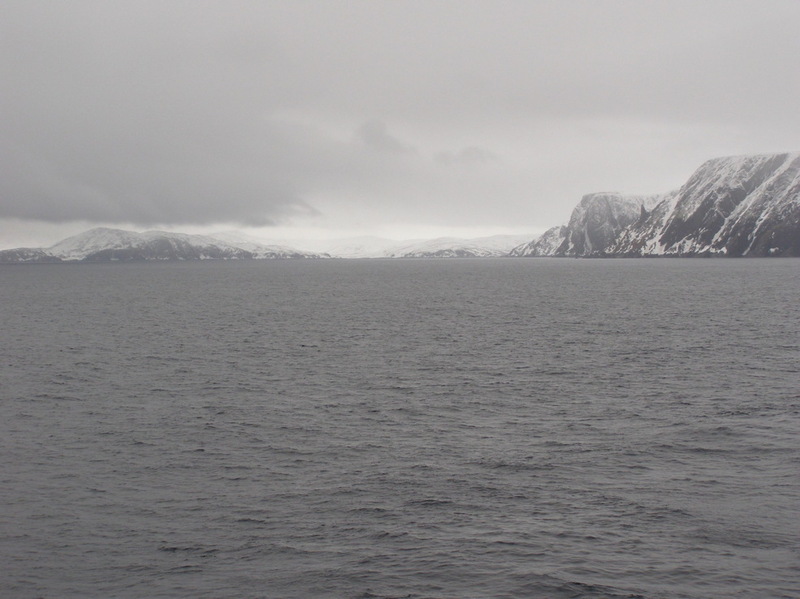 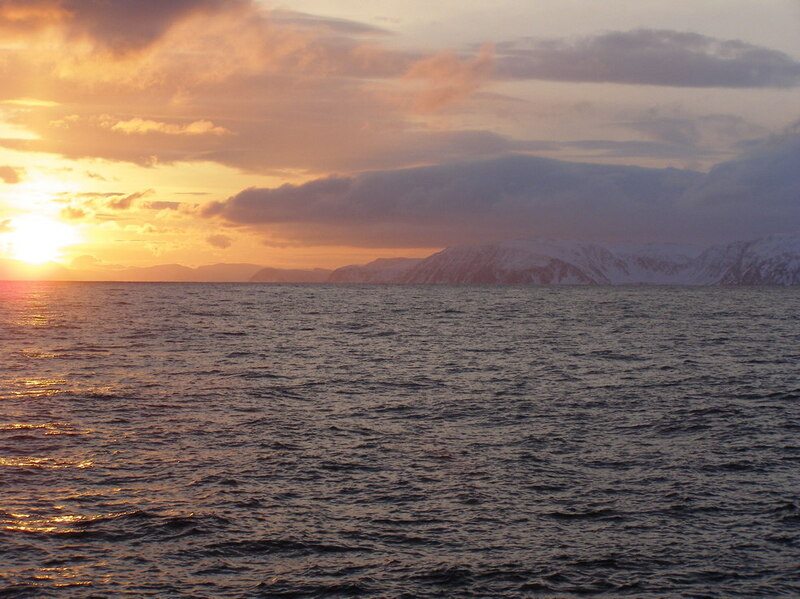 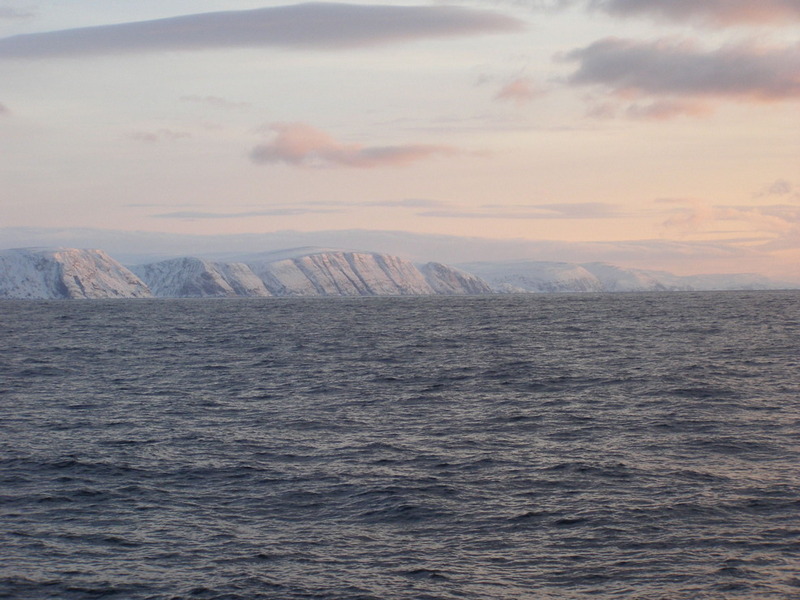 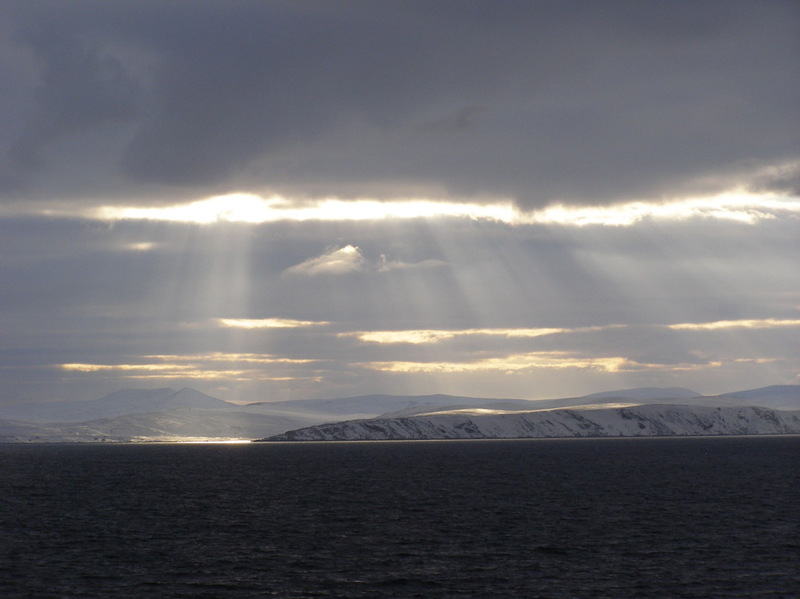 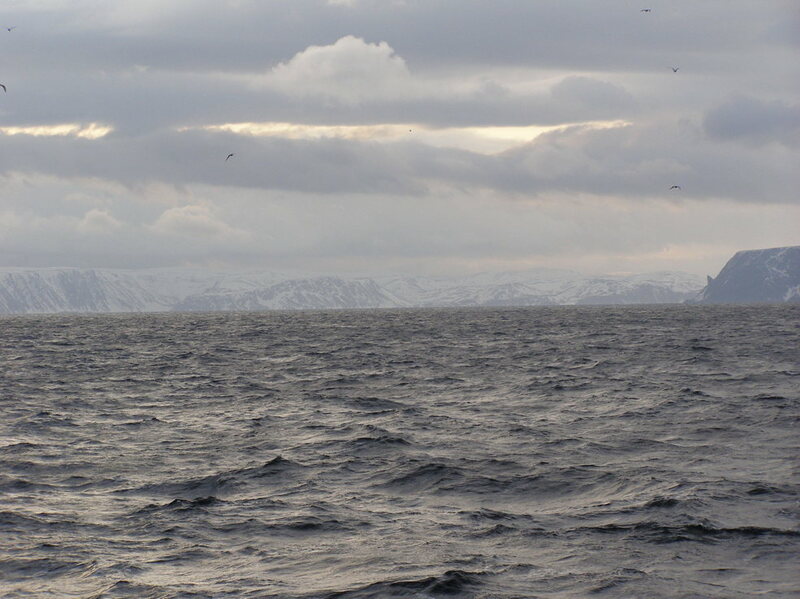 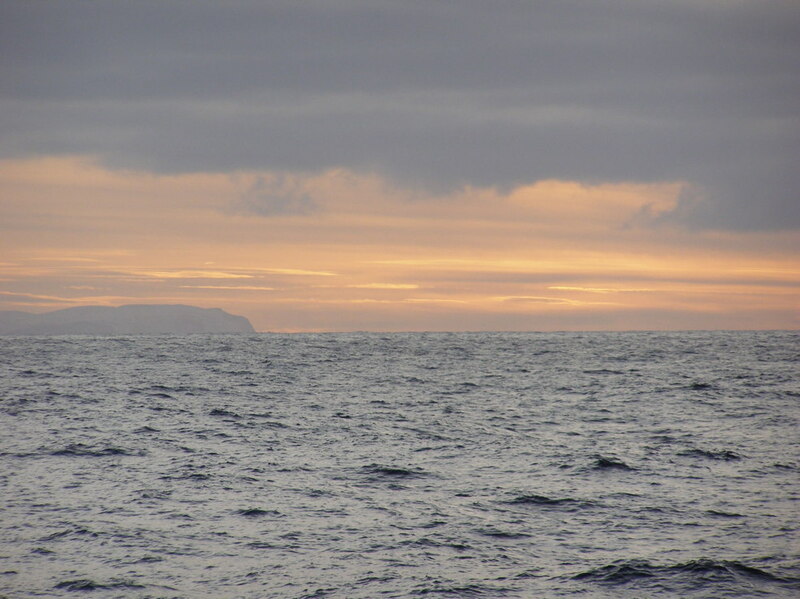 During the winter of 2014, I participated in a sea trip off the coast of Norway. 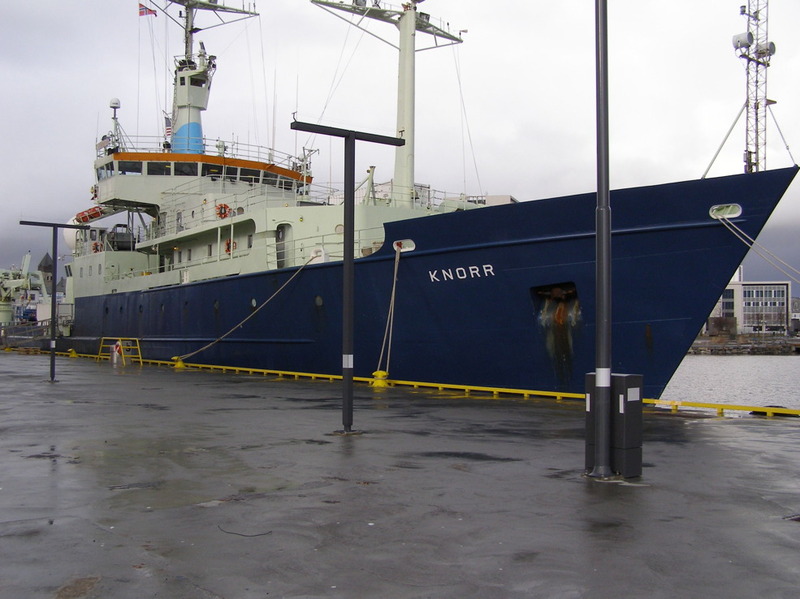 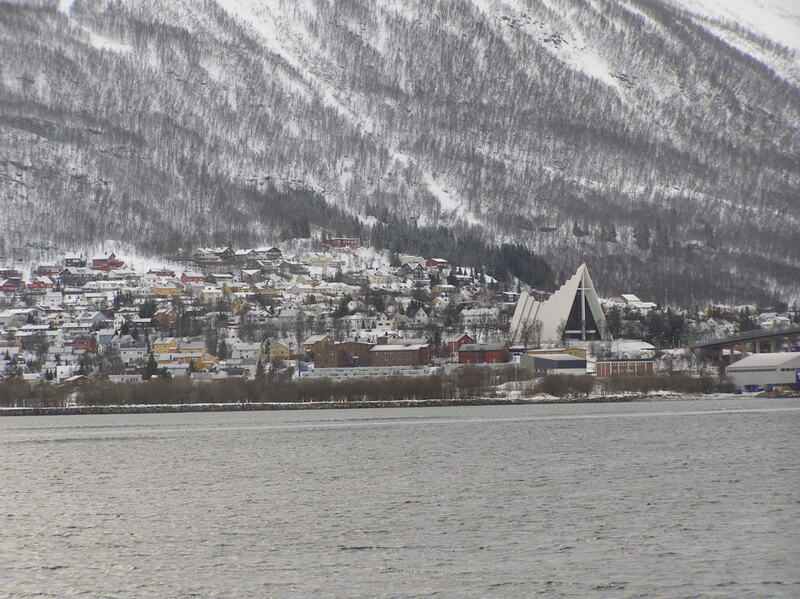 The trip began in Ålesund on February 18 and ended in Tromsø on March 9. 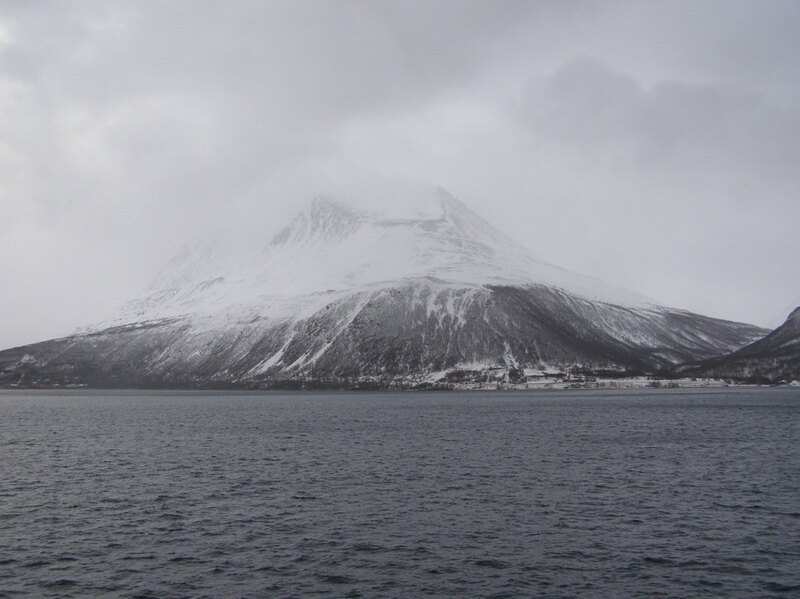 Most of the trip was above the Arctic Circle, including several days above the northernmost tip of Norway up to nearly 72° N. Although the purpose of trip wasn’t to see birds, we visited biologically rich areas with lots of birds. 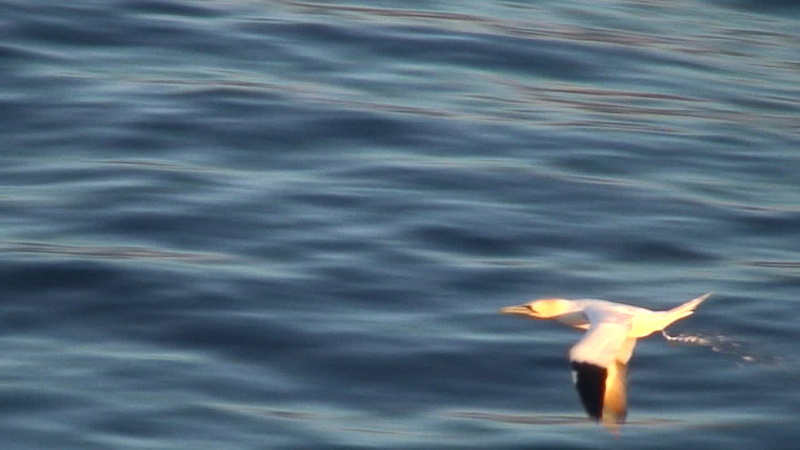 During my free time, I obtained several hours of video footage. 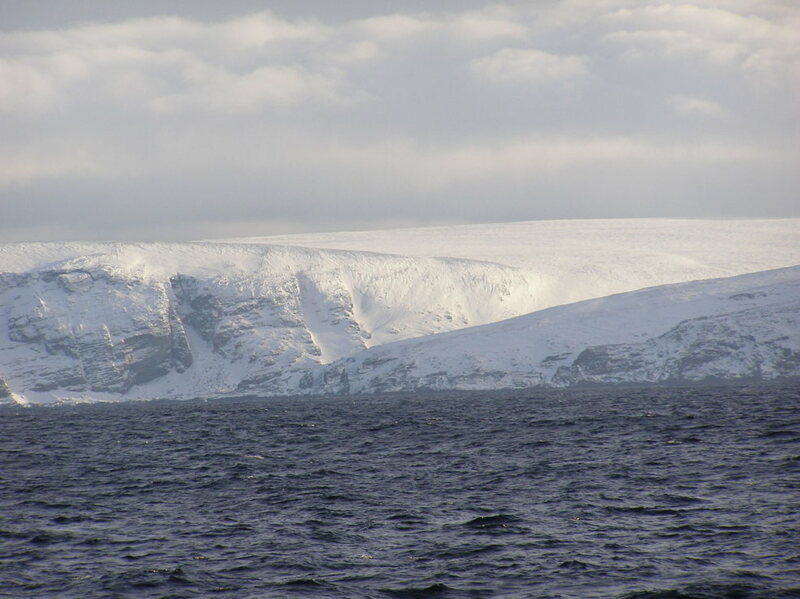 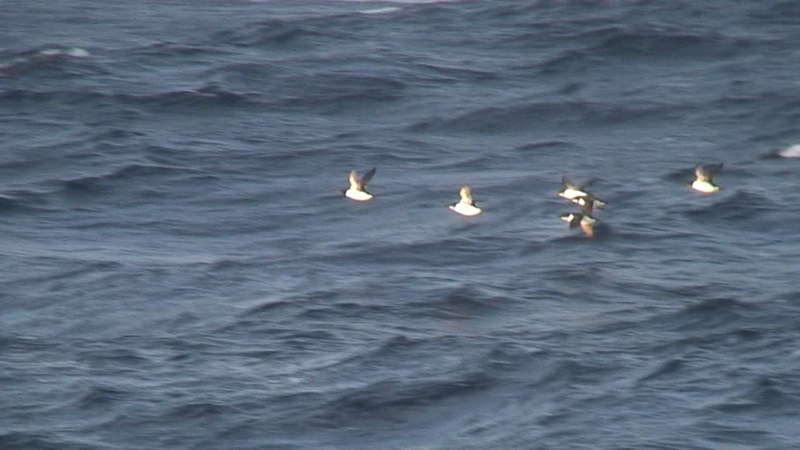 The conditions weren’t always favorable — the ship was often moving at over 10 knots, the birds were often far from the ship, the seas were often rough, the light conditions were often poor, and the lens was often wet — but I hope others will enjoy the scenery and birds in areas that aren’t visited by bird watchers very often. 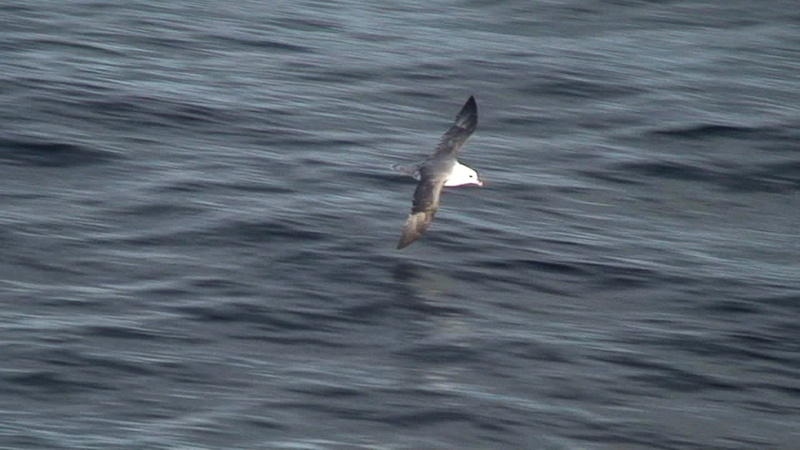 The video was obtained using bino-cam, which consists of a video camera mounted on binoculars. 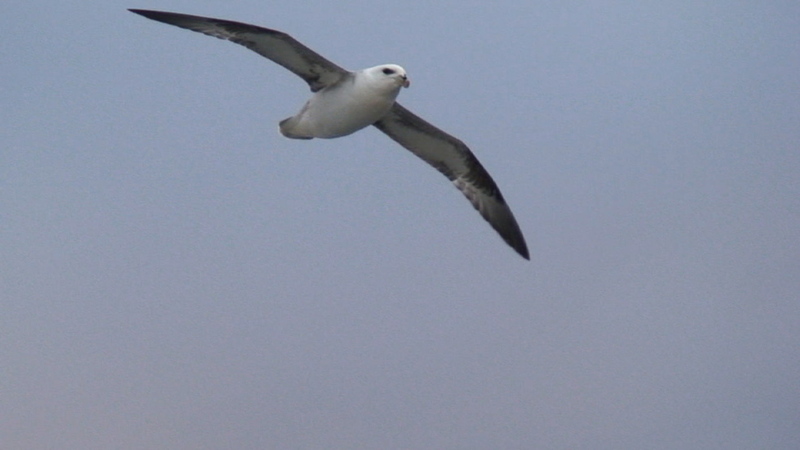 The binoculars provide a much better image than the viewfinder and make it much easier to get the camera on a bird. 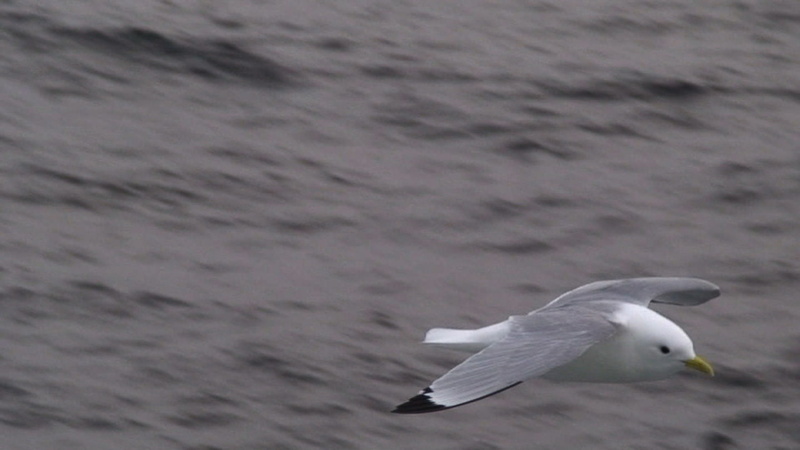 I saw a gull that seemed different from all of the common species that were seen regularly during the trip and suspected it was an Ivory Gull while watching it through binoculars. 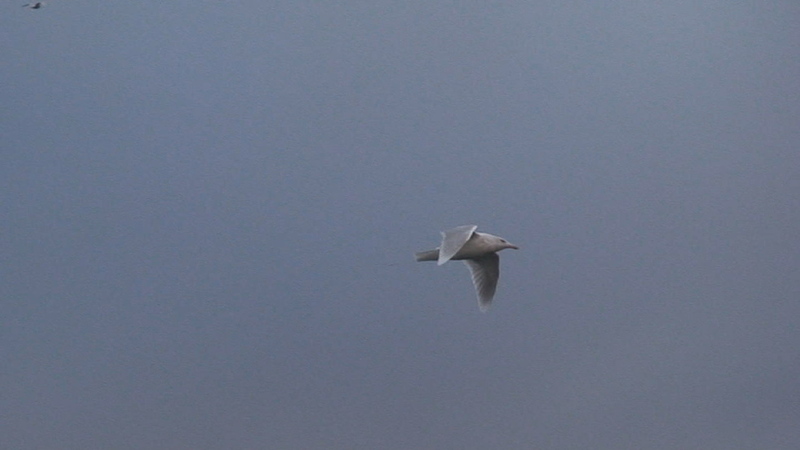 In the video, it appears all white and has tern-like flaps that are consistent with Ivory Gull. 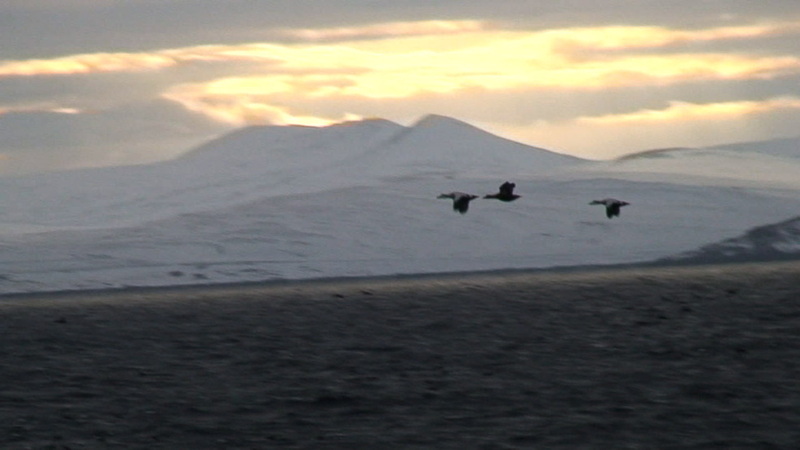 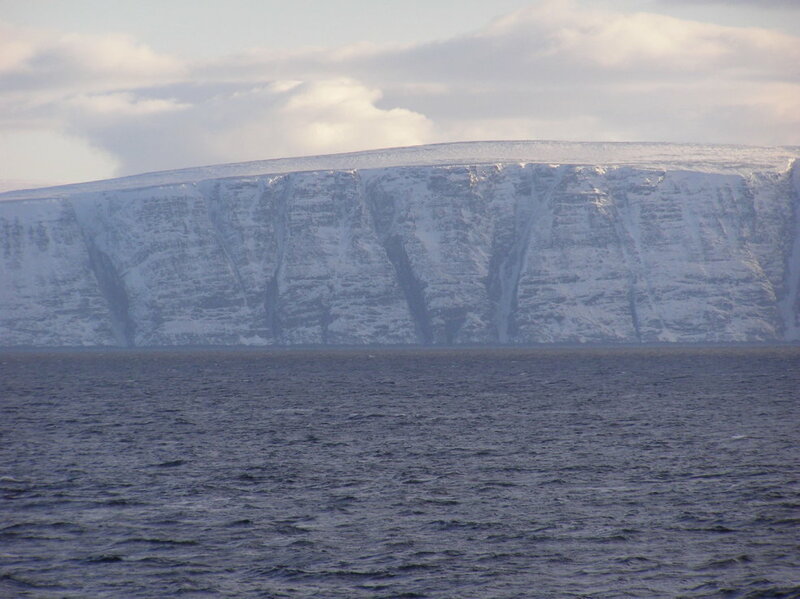 It was exciting to see flocks of alcids with stunning Arctic scenery in the background. 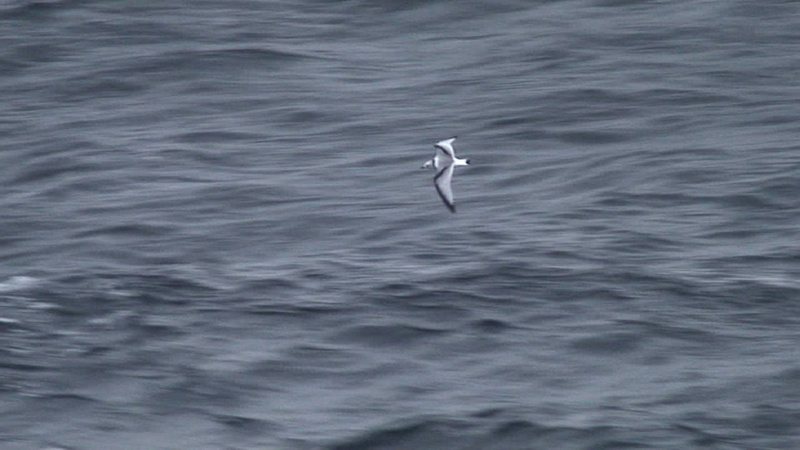 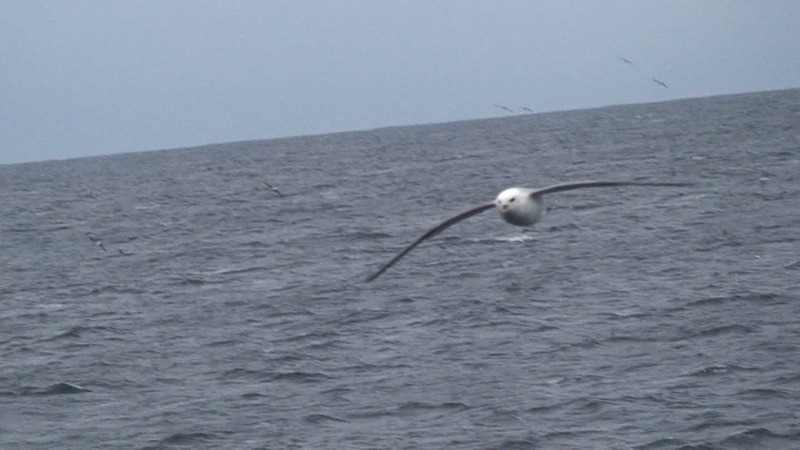 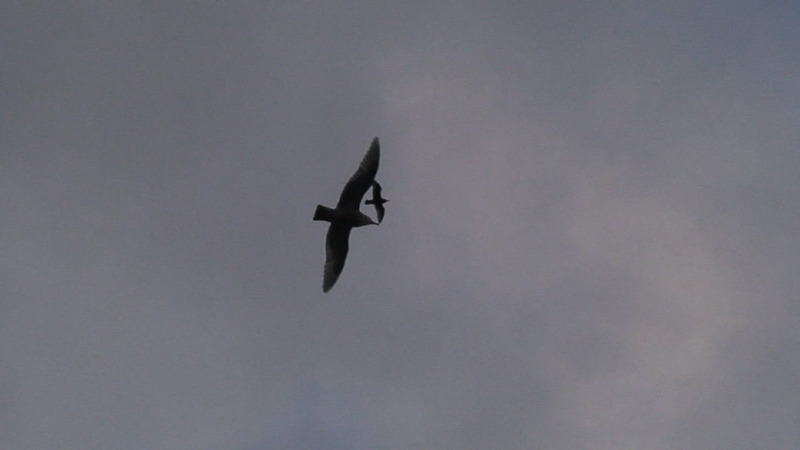 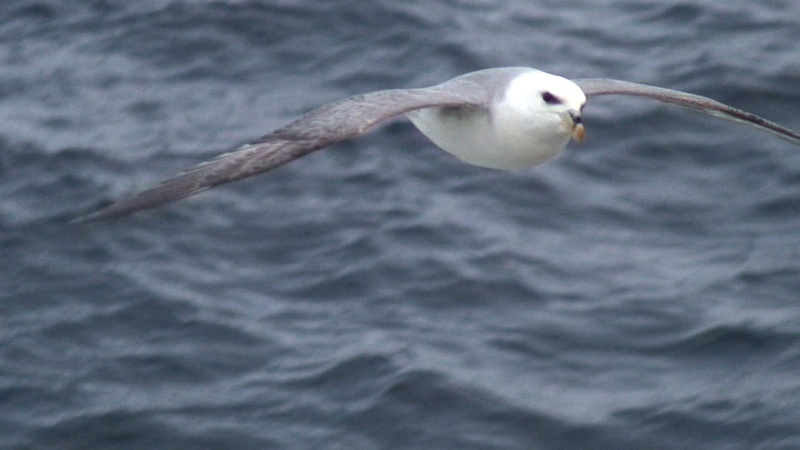 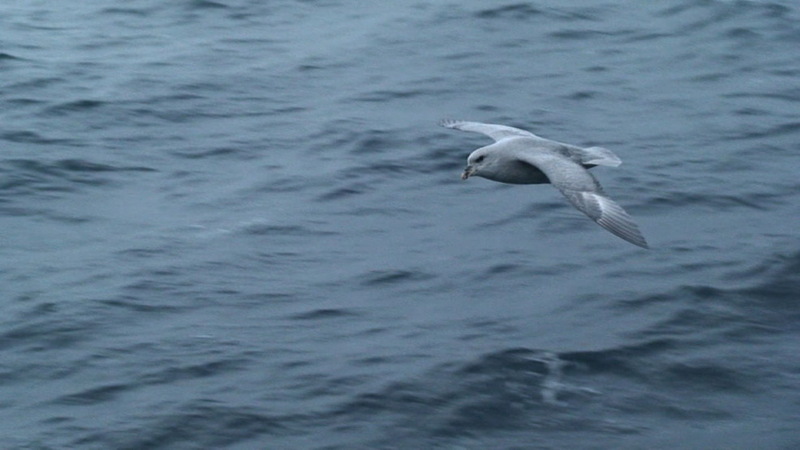 I never got tired of watching fulmars in flight. 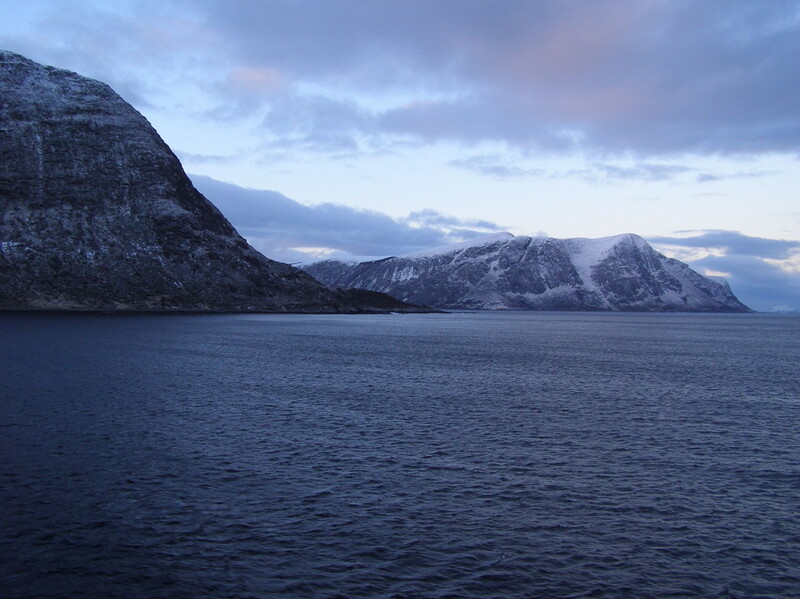 The northern lights were indescribably amazing on some nights, with some of the glowing green arcs passing directly above and extending from one horizon to the other. 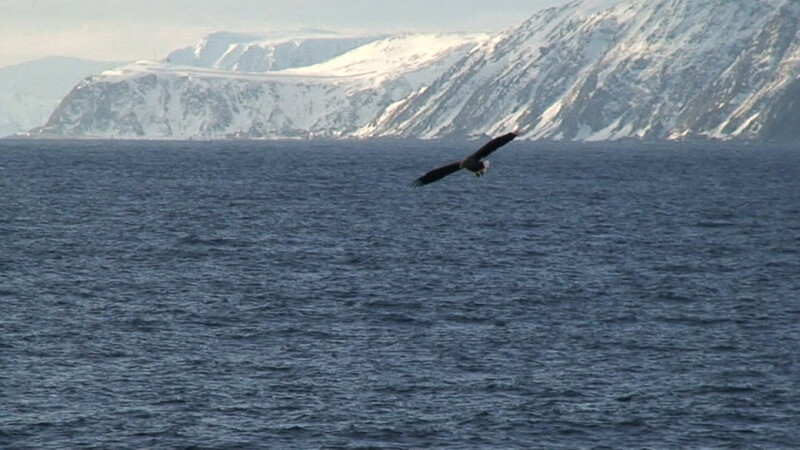 Movie 1 (2:01) Introduction to a series of movies that were obtained during a sea trip off the coast of Norway during the winter of 2014. 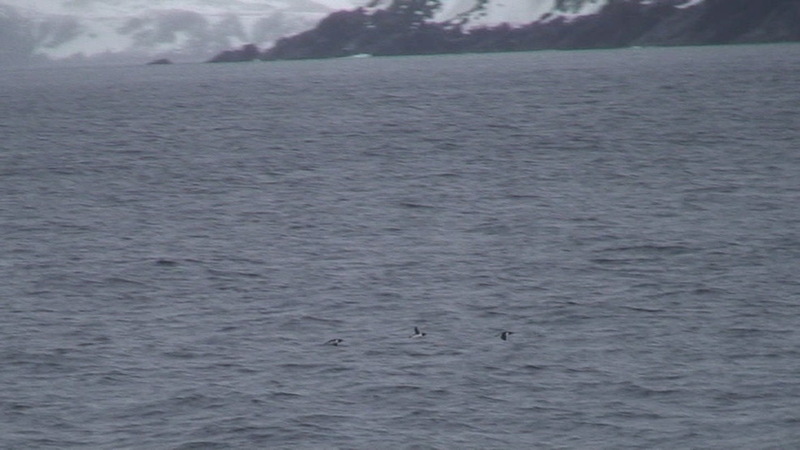 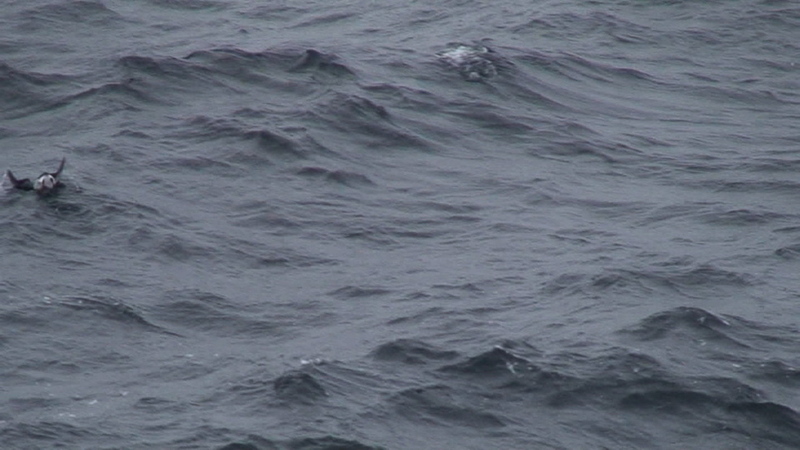 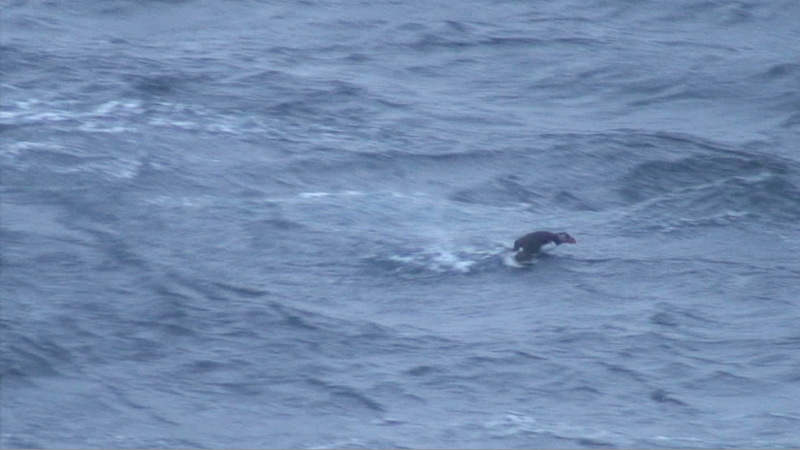 Movie 2 (0:27) Razorbills that surfaced near the ship. 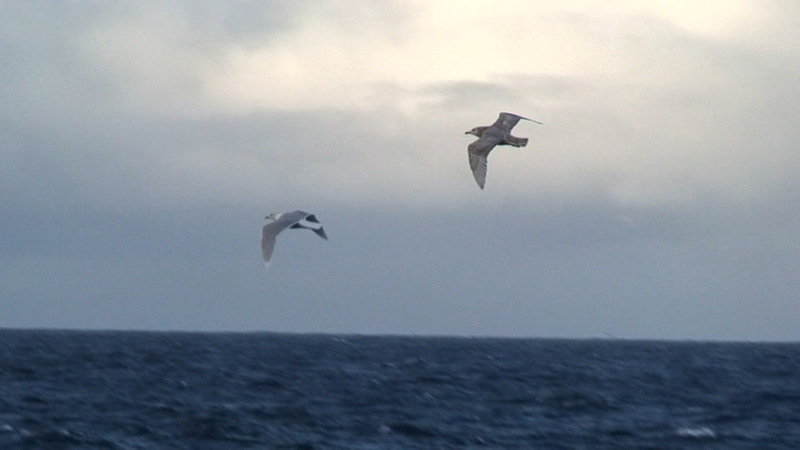 One of them had a bit of a problem getting airborne. 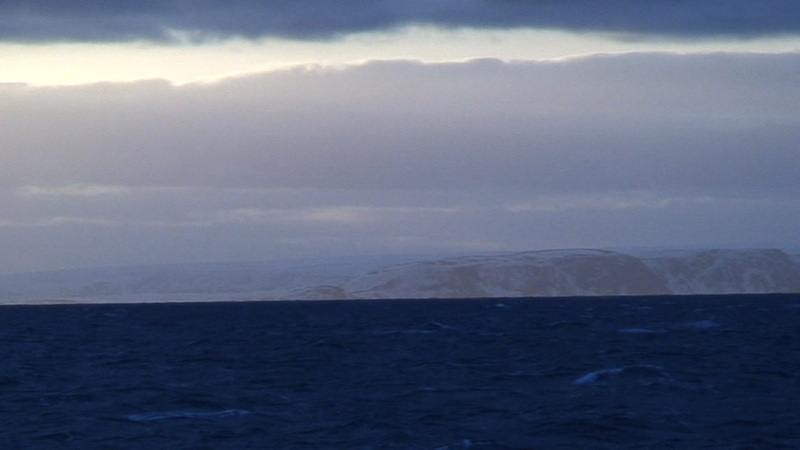 The movie plays at half speed. 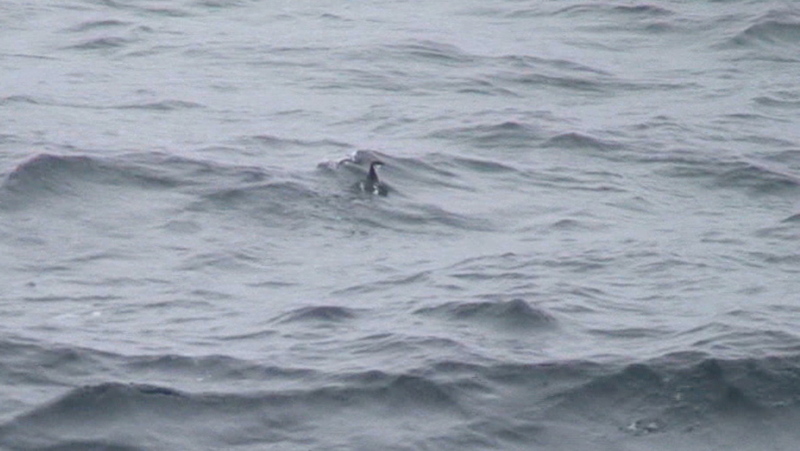 Movie 3 (0:50) Puffin that surfaced near the ship. 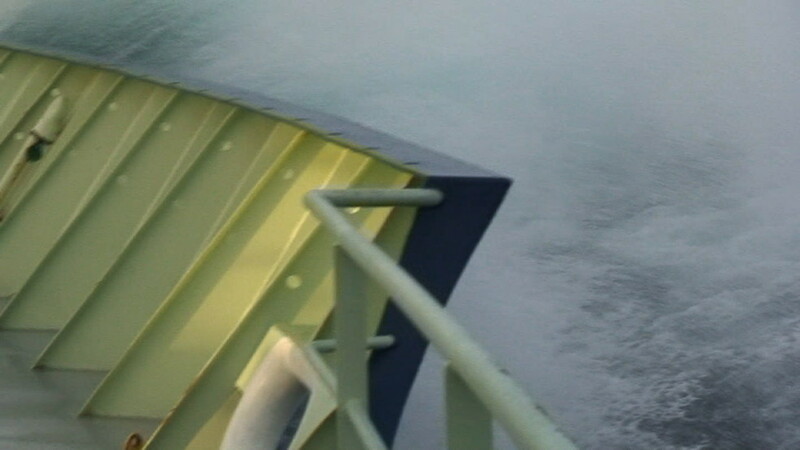 The movie plays at half speed. 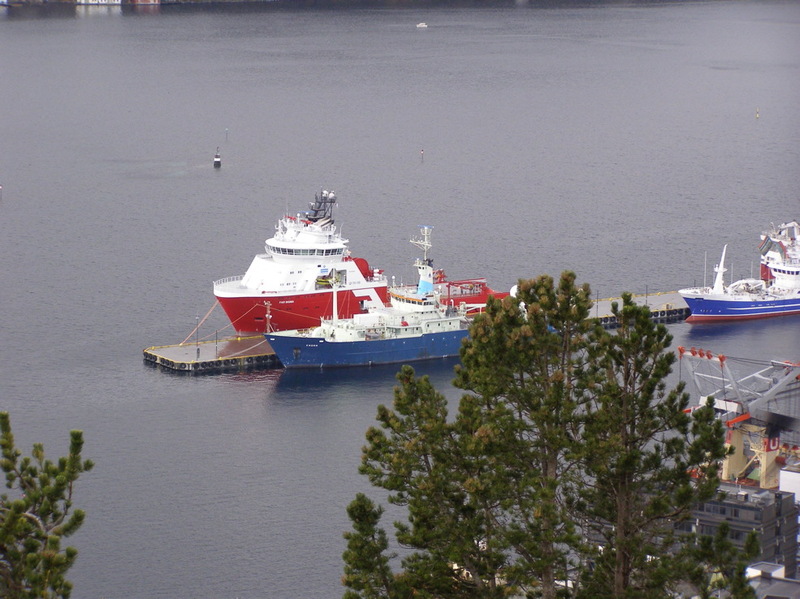 Movie 4 (13:17) Departed Ålesund during the morning of February 18. 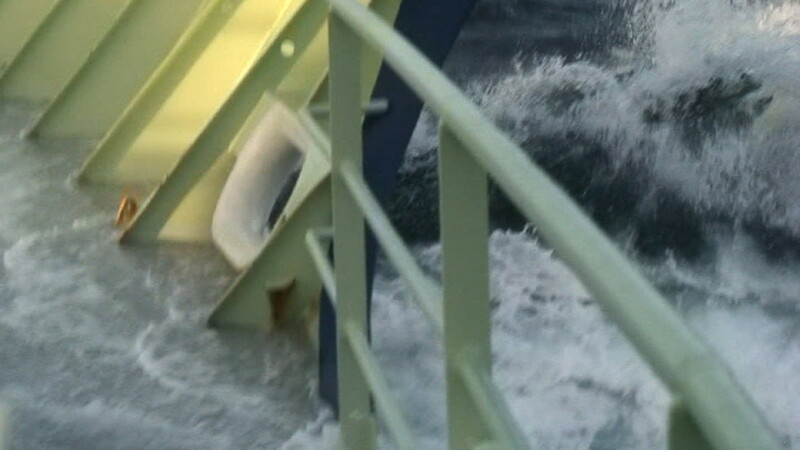 Footage from the dock and on the way out. 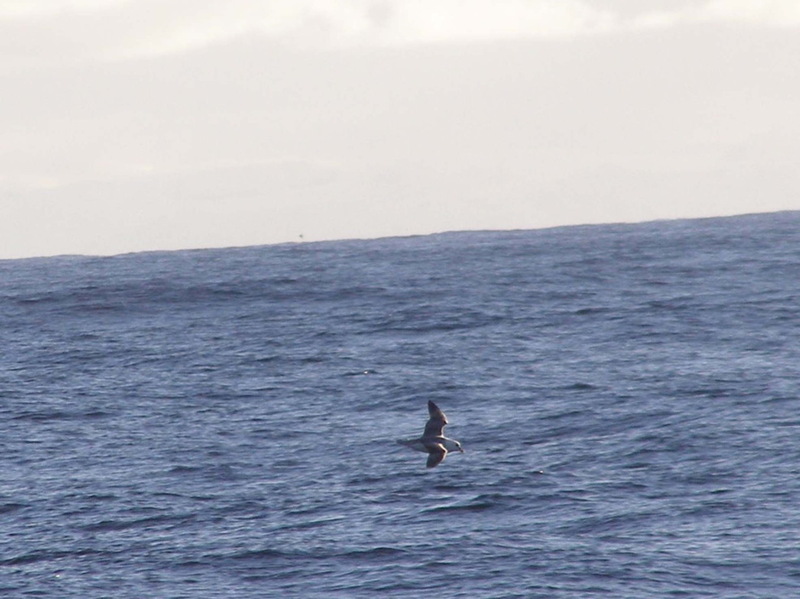 Scenery of the coast and sea birds. 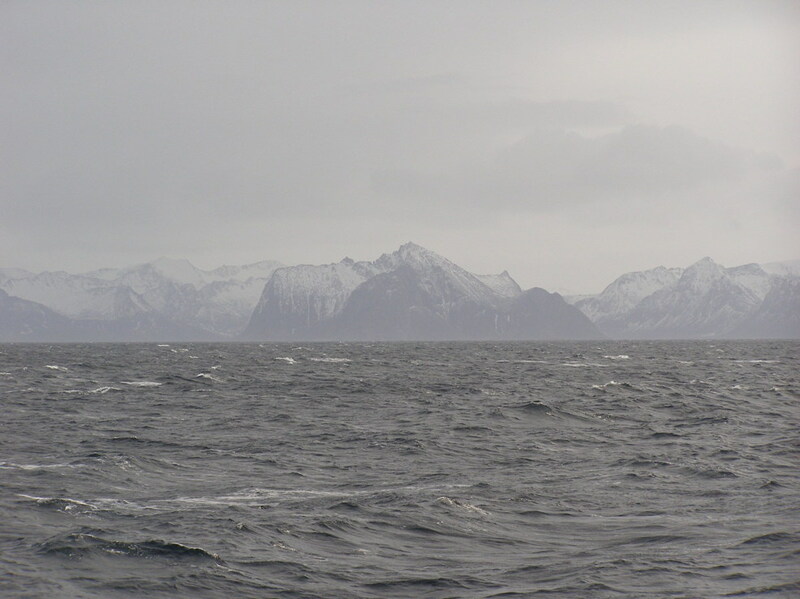 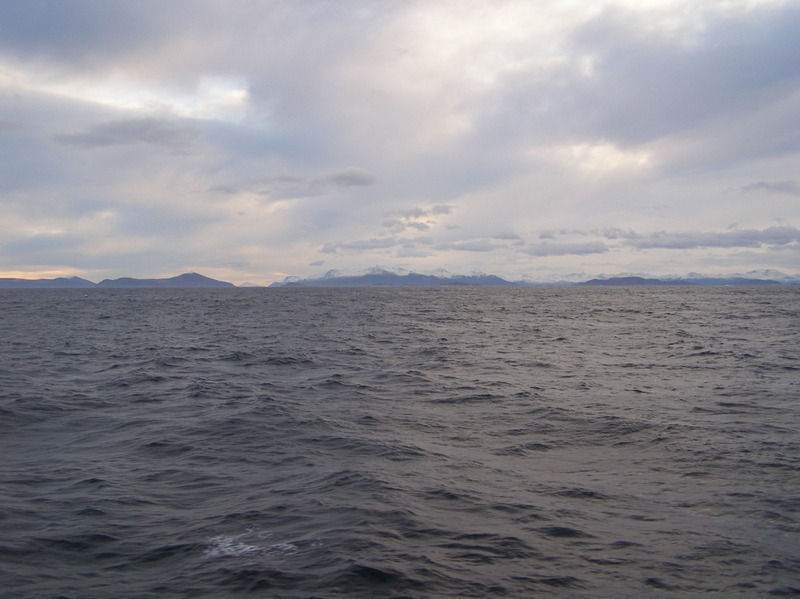 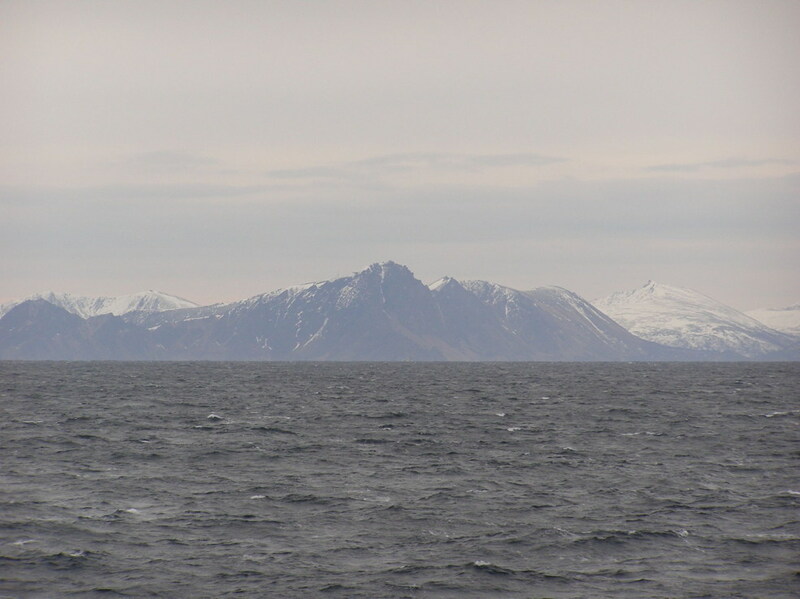 Movie 5 (14:23) Off the coast from Ålesund. 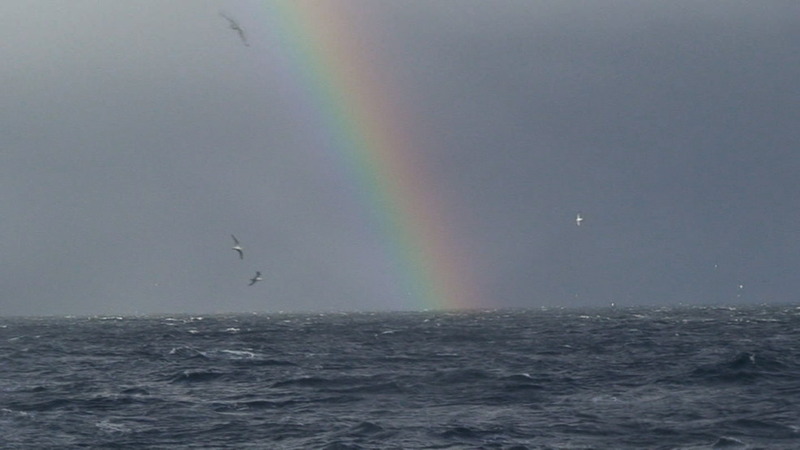 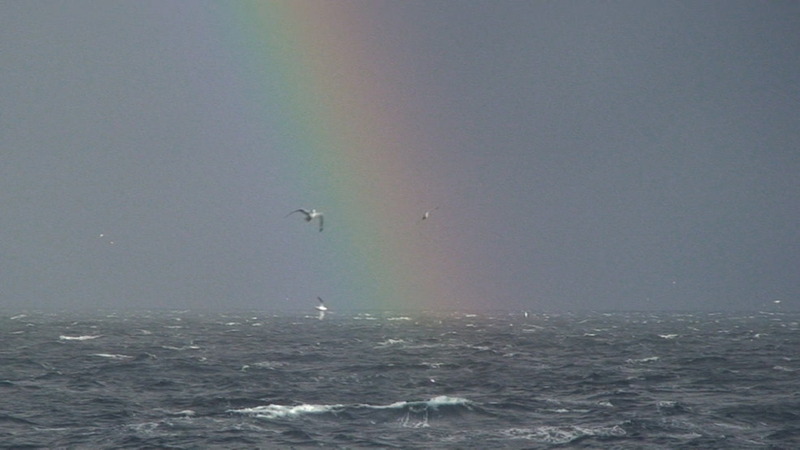 Birds attracted to a spotlight at night and flying near the end of a rainbow during the day. 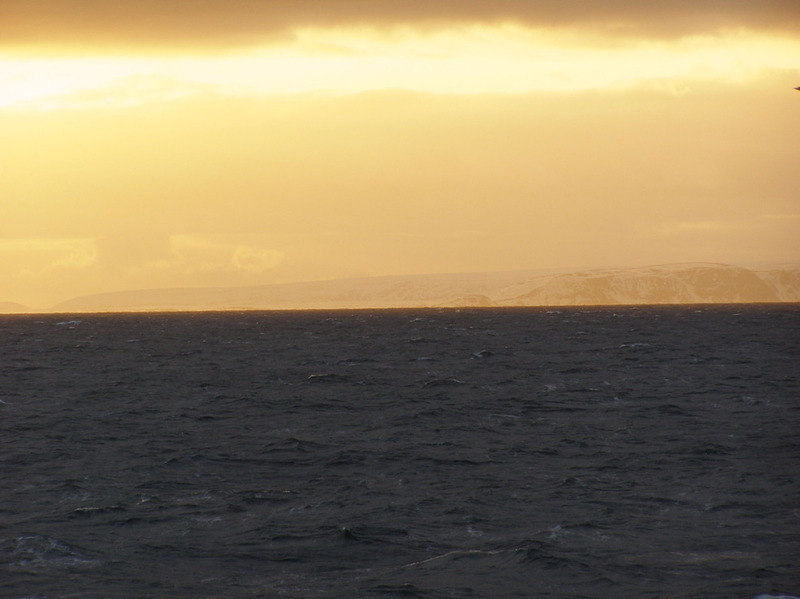 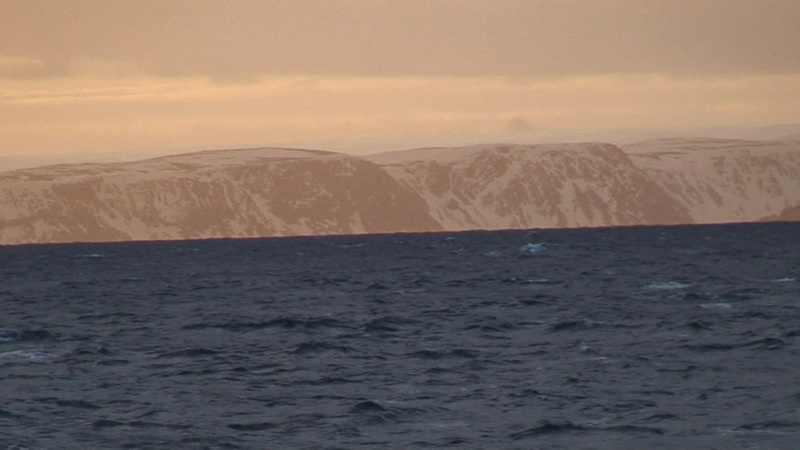 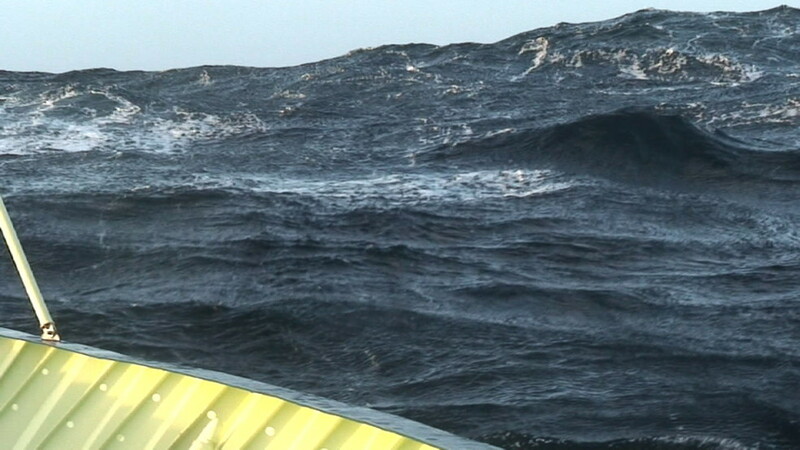 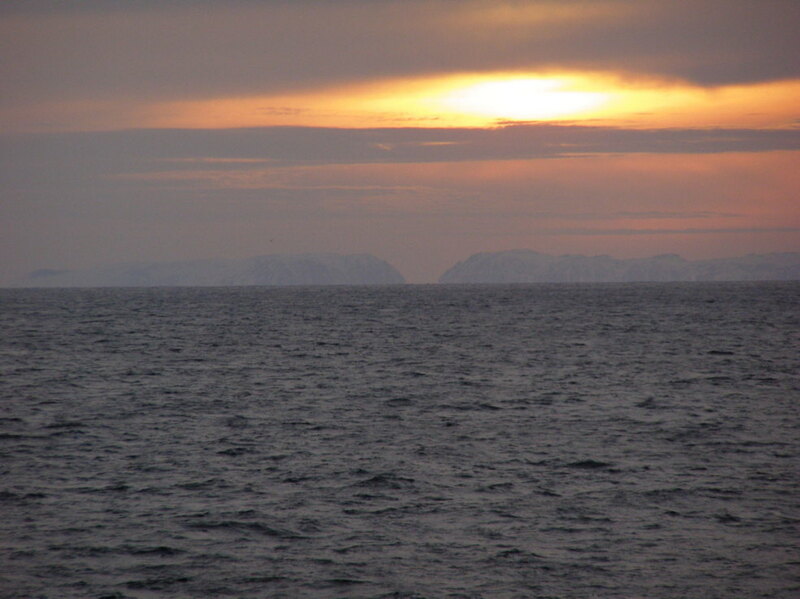 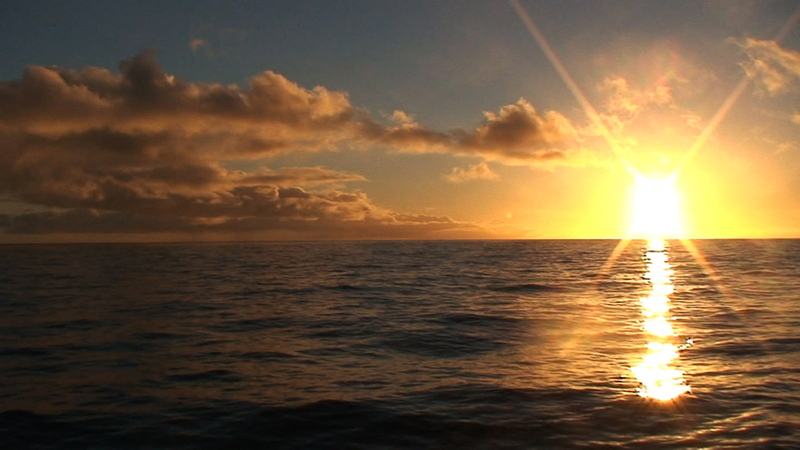 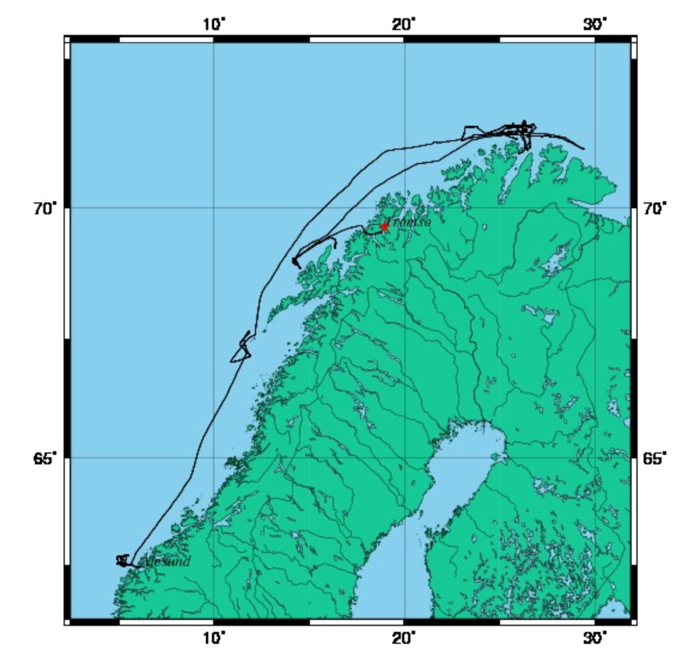 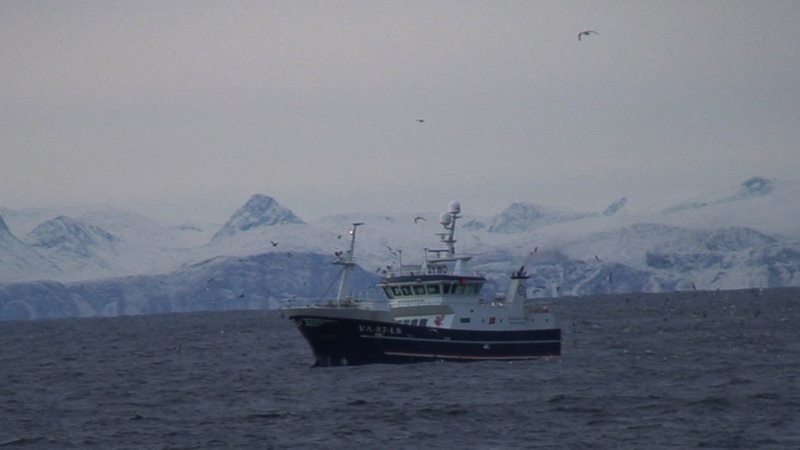 Movie 6 (10:13) Arrival off the coast of Lofoten on February 23 after a transit north from the Ålesund area. 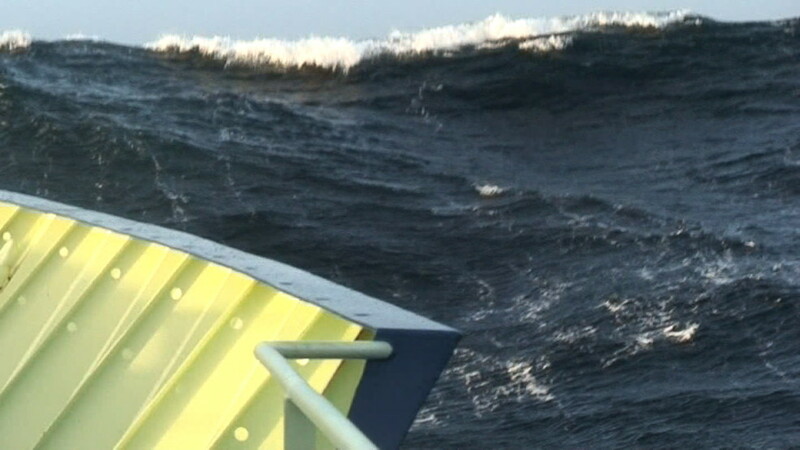 Movie 7 (12:57) High waves during the morning of February 24 after a storm that peaked during the night at Sea State 7 (25 ft. waves were observed from the bridge). 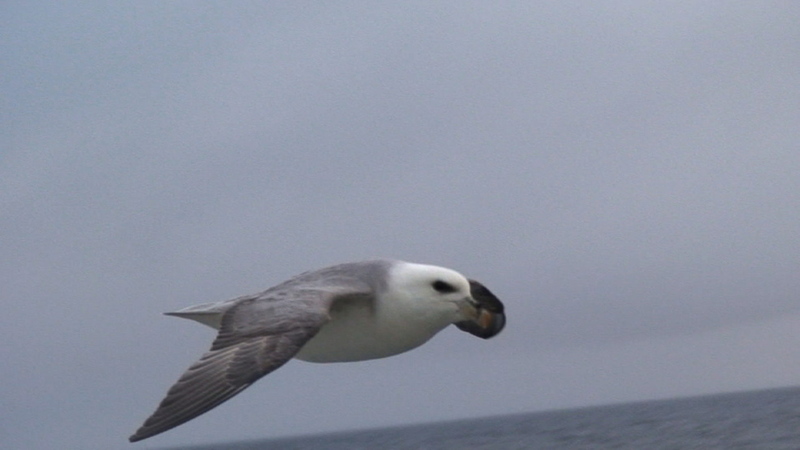 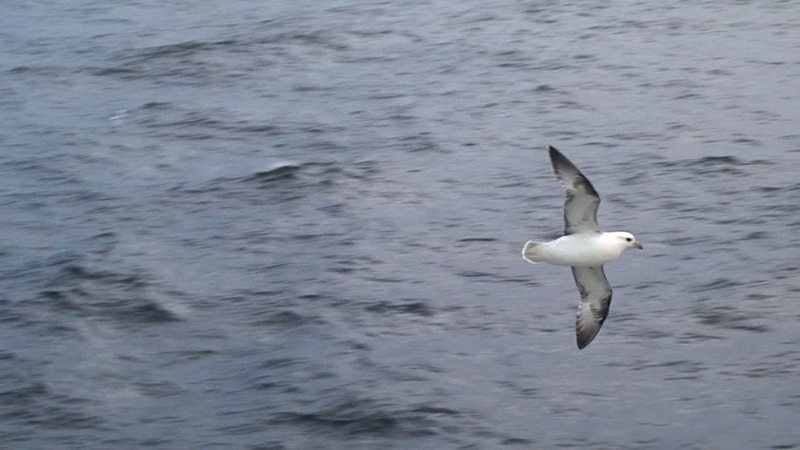 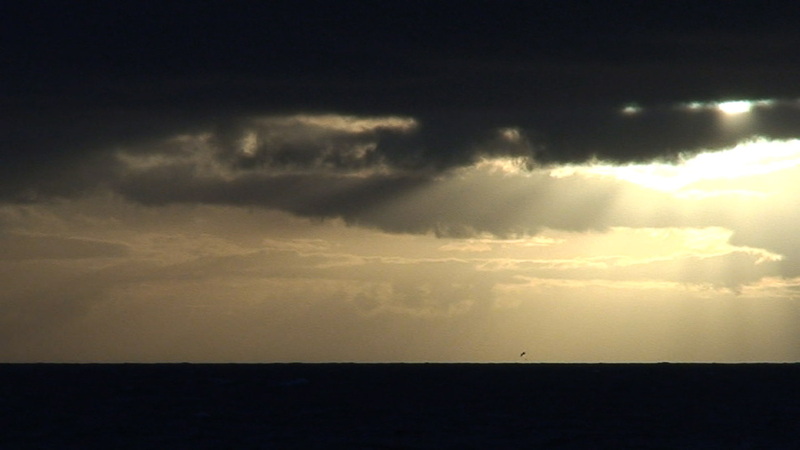 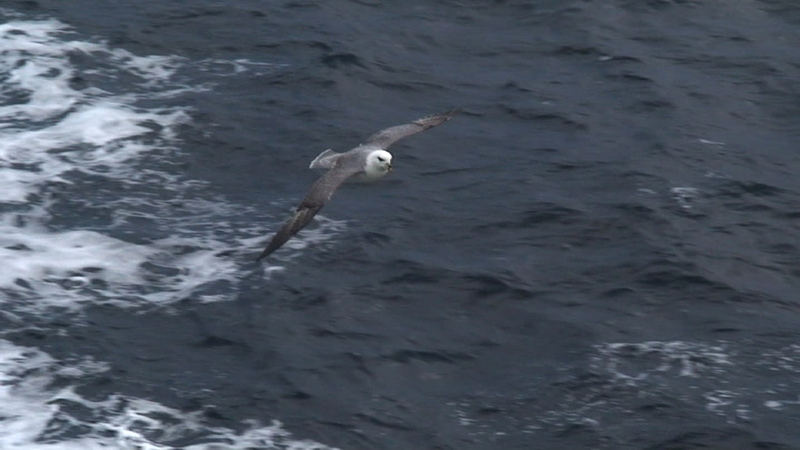 Movie 8 (6:43) The remarkable flights of Northern Fulmars after the storm. 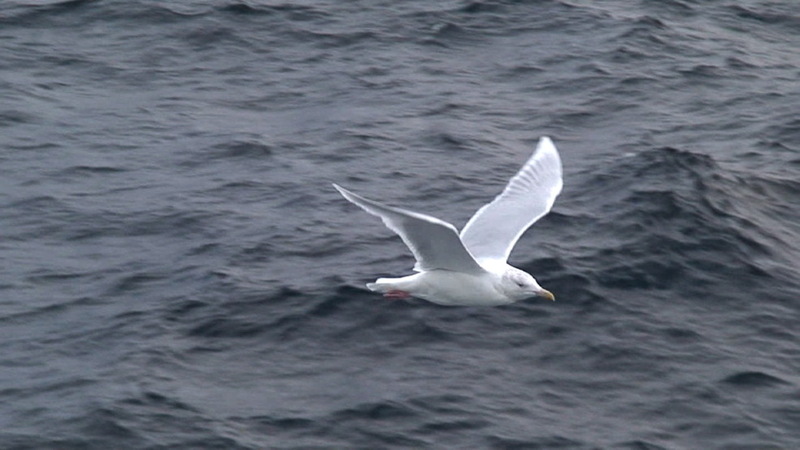 Movie 9 (13:12) Nice views of Northern Fulmars, Black-legged Kittiwakes, and Glaucous Gulls flying past the ship’s exhaust vent in the Lofoten area. 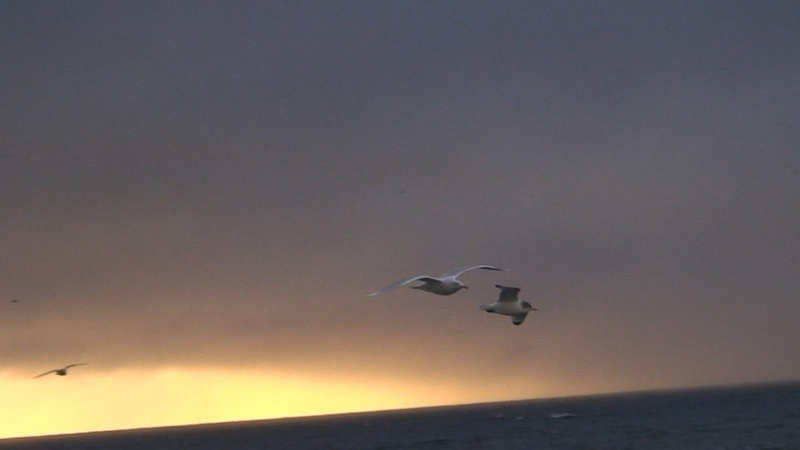 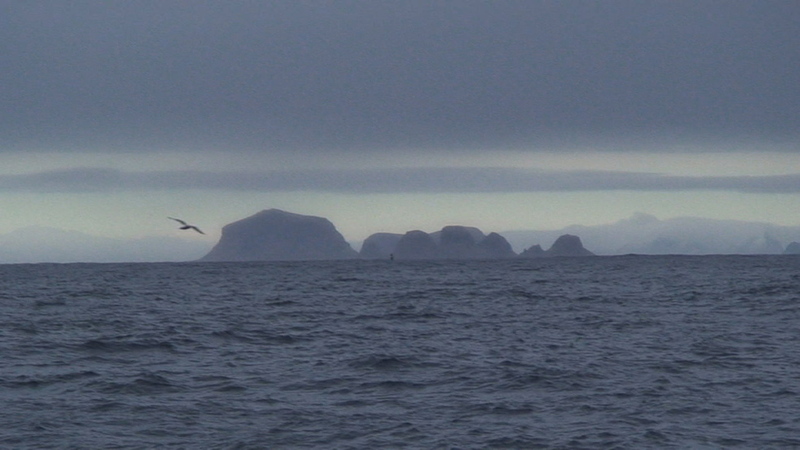 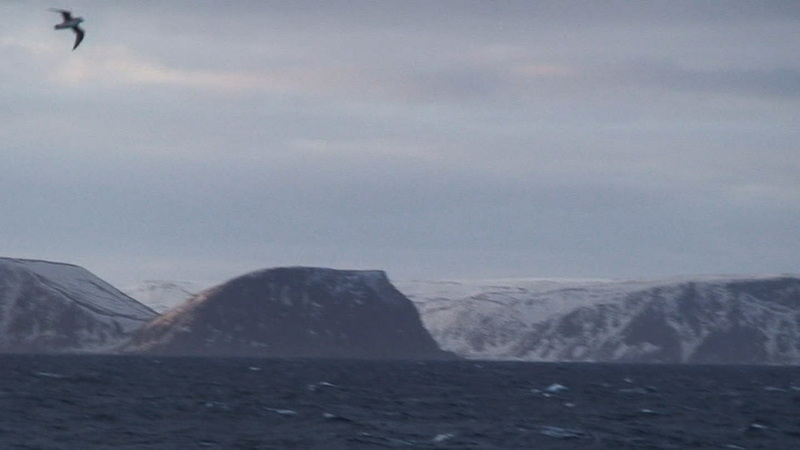 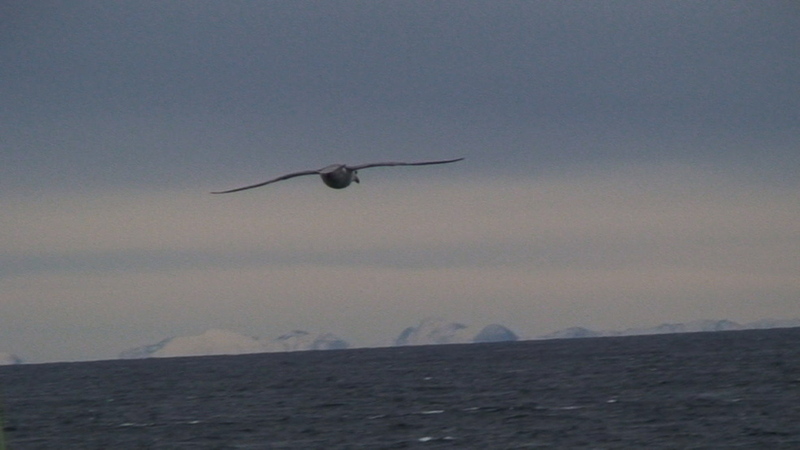 Movie 10 (14:55) The morning of February 26 above the northernmost tip of Norway at 71.25° N, 27.58° E. Scenery in the early morning and alcids in flight. 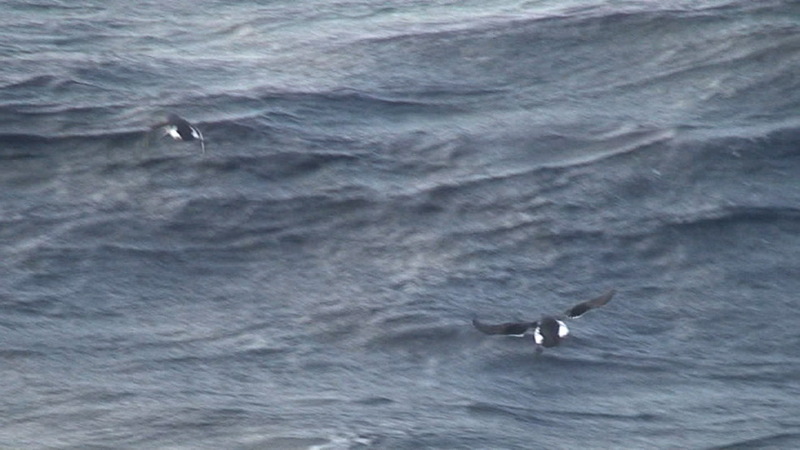 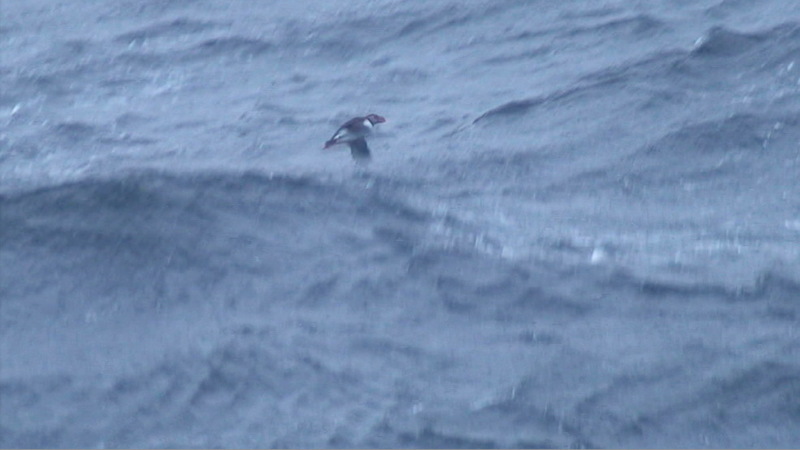 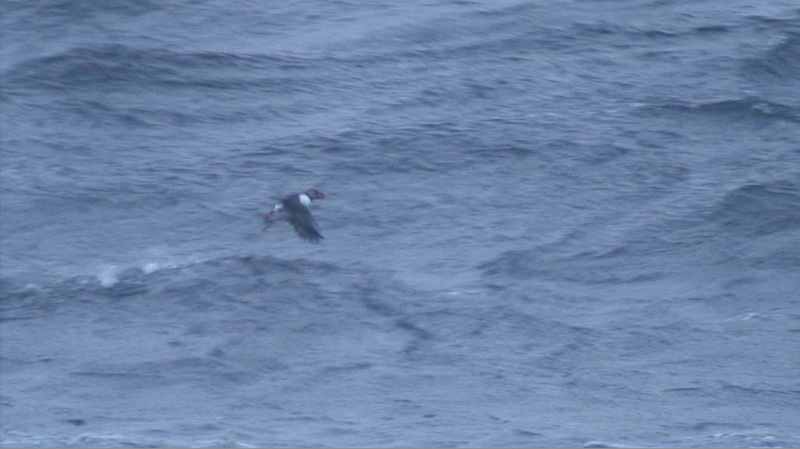 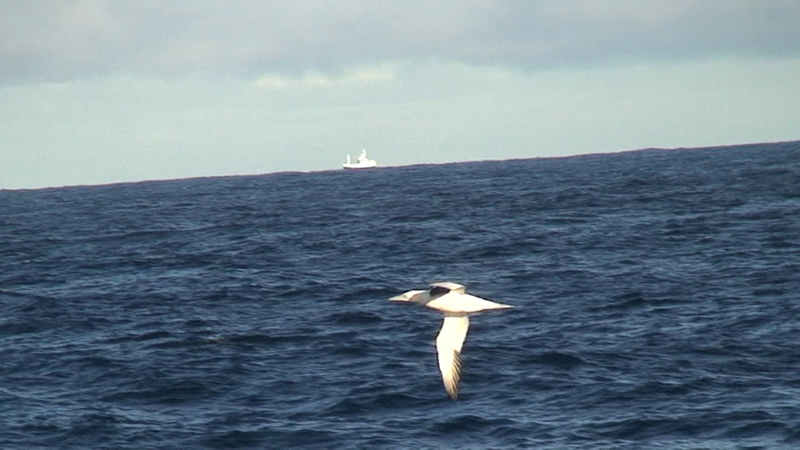 The birds are far from the ship, but Atlantic Puffins and Razorbills are identifiable in some cases in the original high-definition source footage. 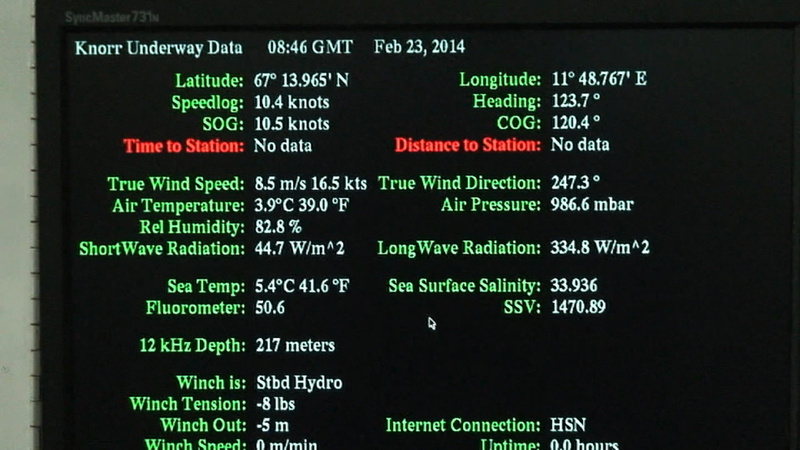 Movie 11 (10:20) Additional footage from the morning of February 26. 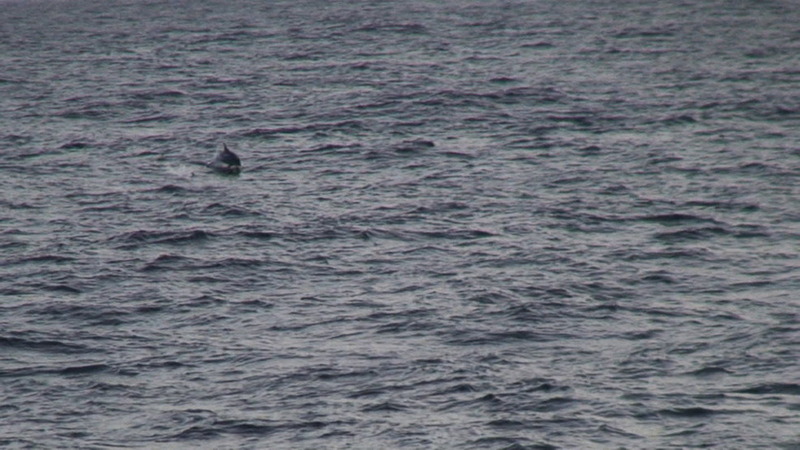 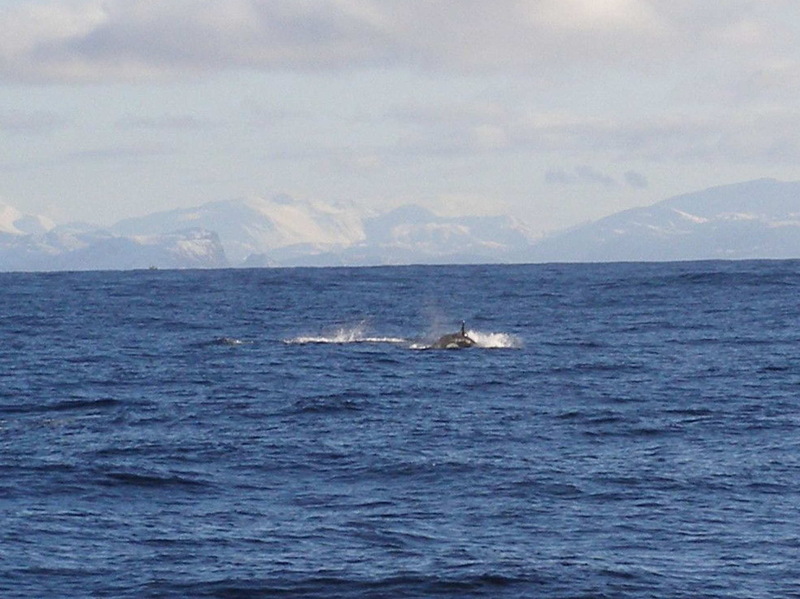 Begins with a pod of White-beaked Dolphins. 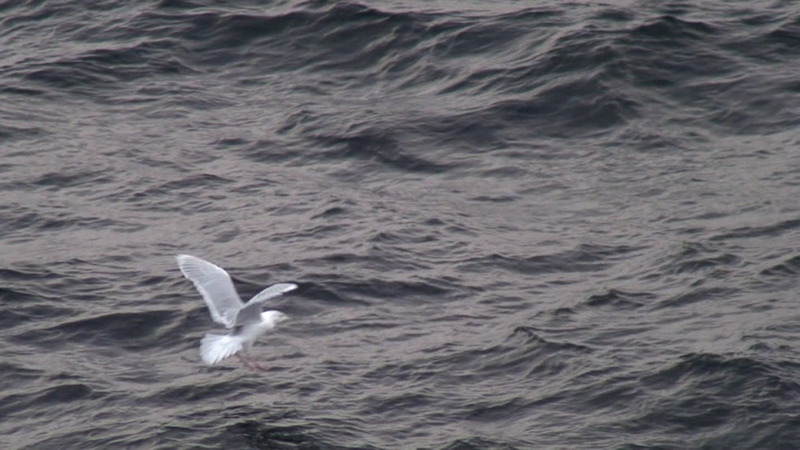 Then comes footage of a gull that appears to be all white. 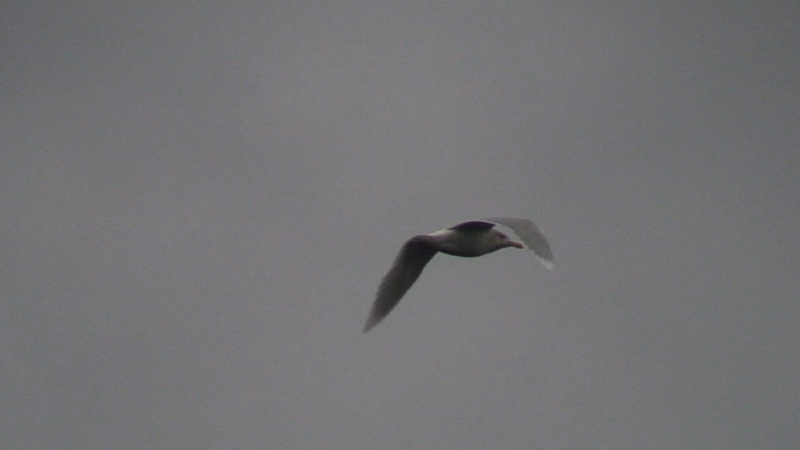 The tern-like flaps are consistent with Ivory Gull but don’t seem to be consistent with any of the common gulls in the area. 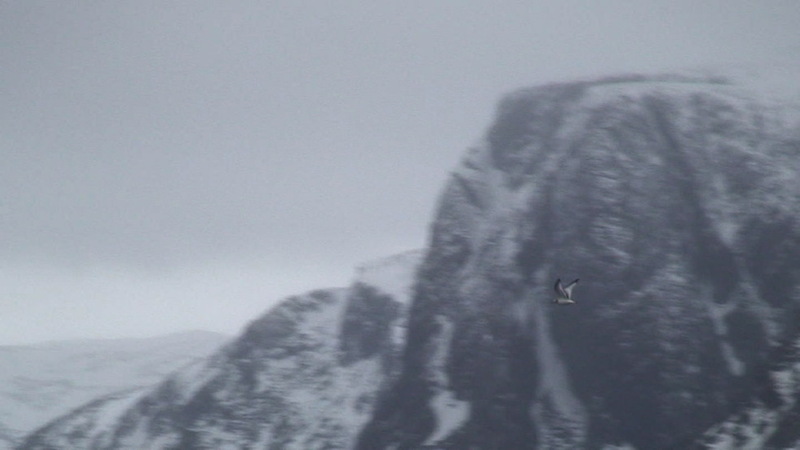 Movie 12 (14:27) Northern tip of Norway on the morning of February 28. 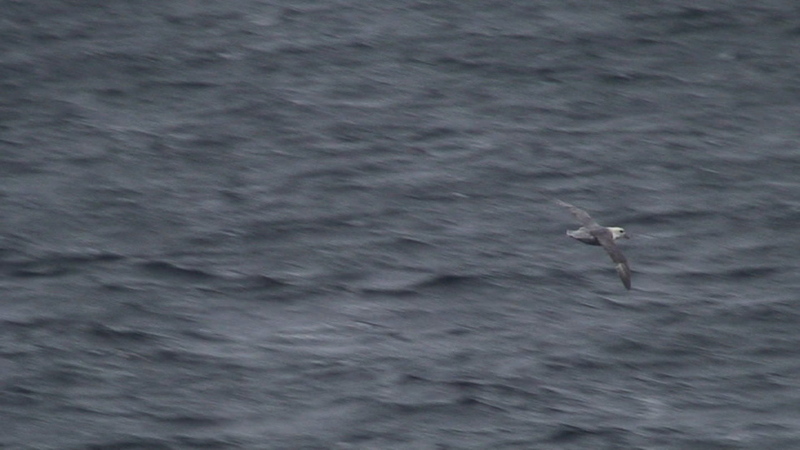 Nice views of dark morph Northern Fulmars, coastal scenery, and alcids. 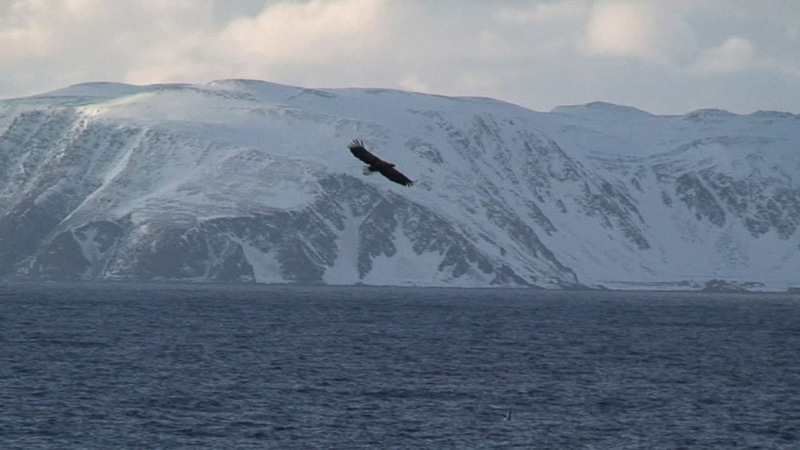 Movie 13 (9:57) Footage from March 2 of a White-tailed Sea Eagle in the mouth a fjord at 71.01° N, 26.44° E.
Movie 14 (13:10) Footage from March 3 of lots of alcids as we exited the mouth of the fjord. 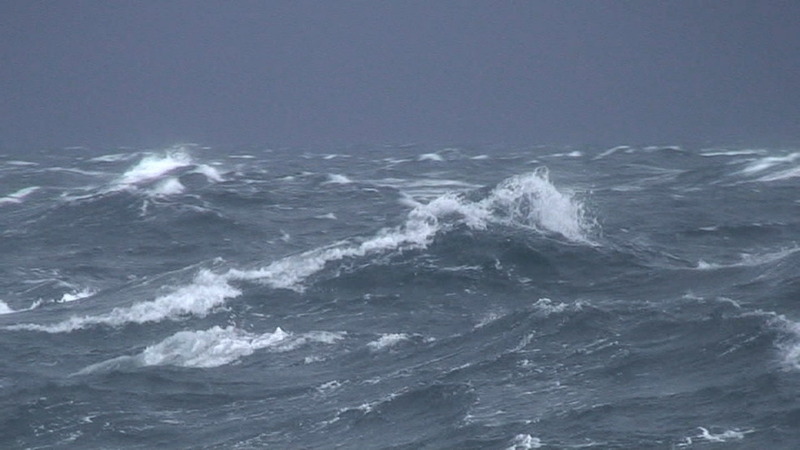 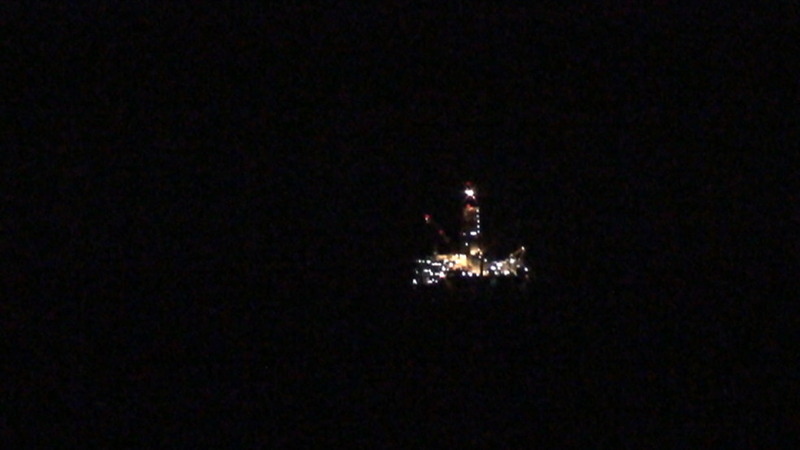 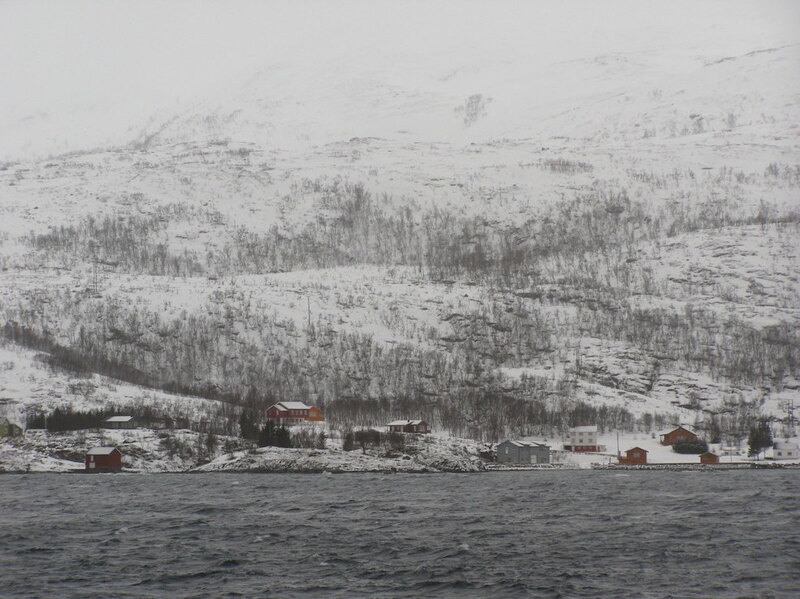 Movie 15 (11:26) Footage from March 8 of lots of alcids as we sailed north along the coast to Tromsø. 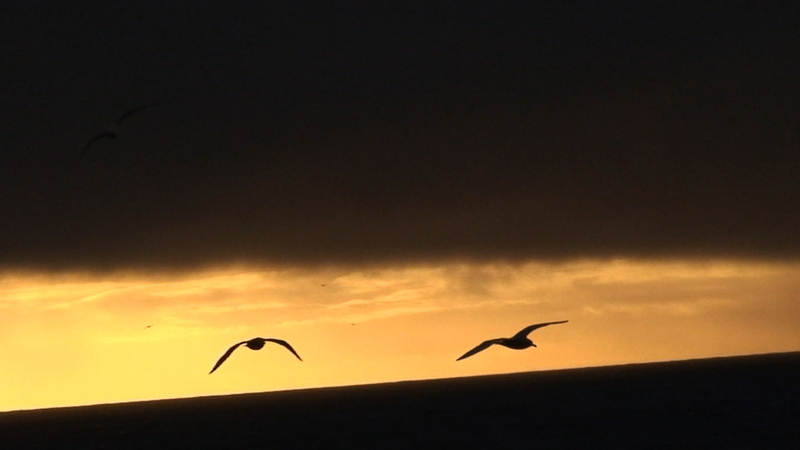 Movie 16 (10:58) A continuation of the previous movie. 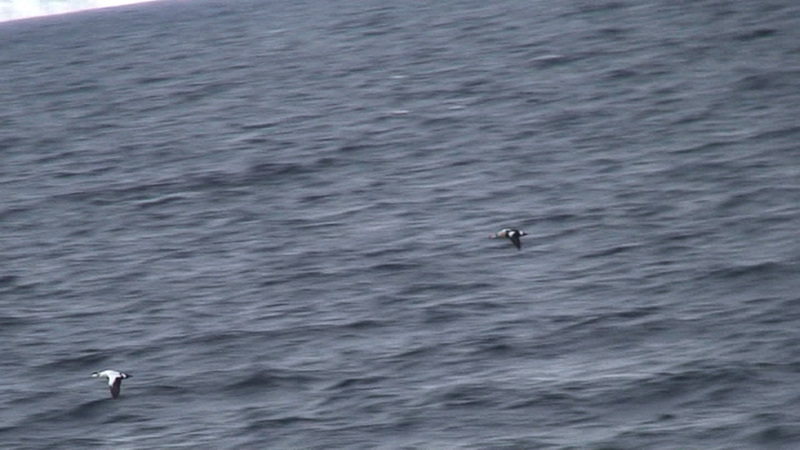 Footage from close range of a puffin starting at 7:52. 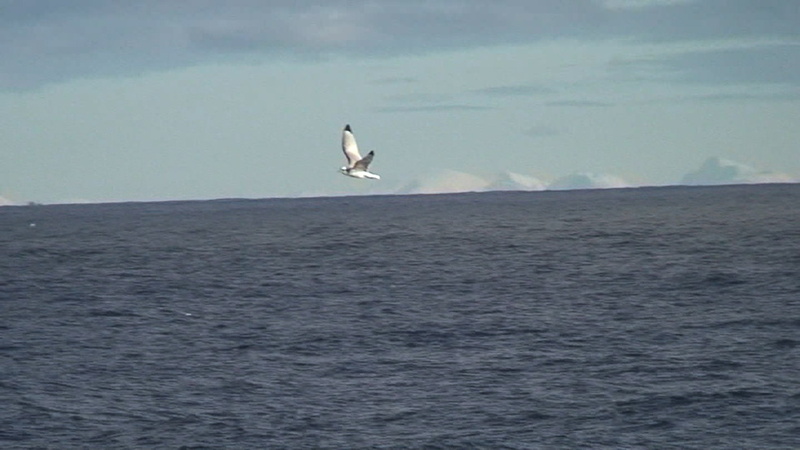 Movie 17 (6:45) Whale spouts and alcids. 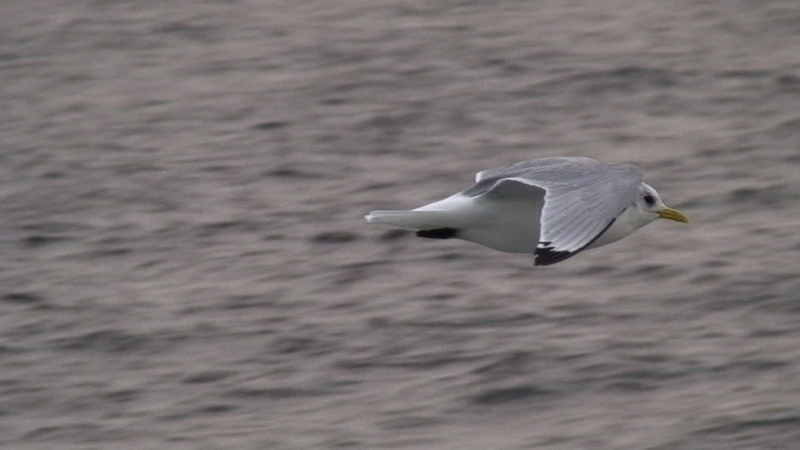 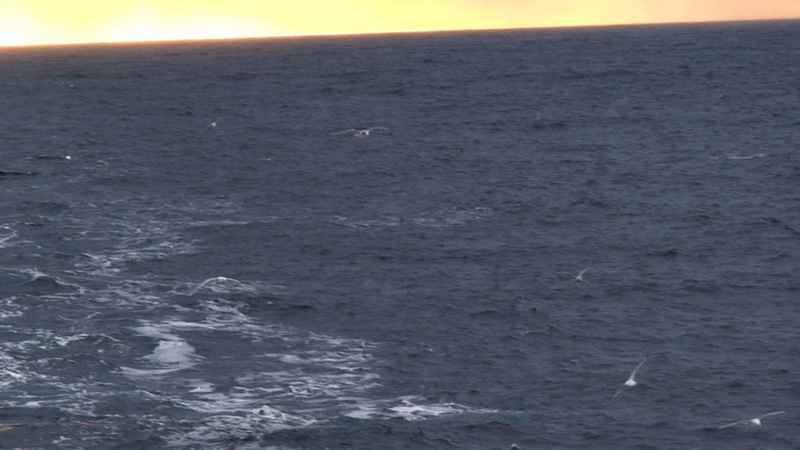 Movie 18 (0:53) Possible Ivory Gull at full speed and 1920x1080 pixels. 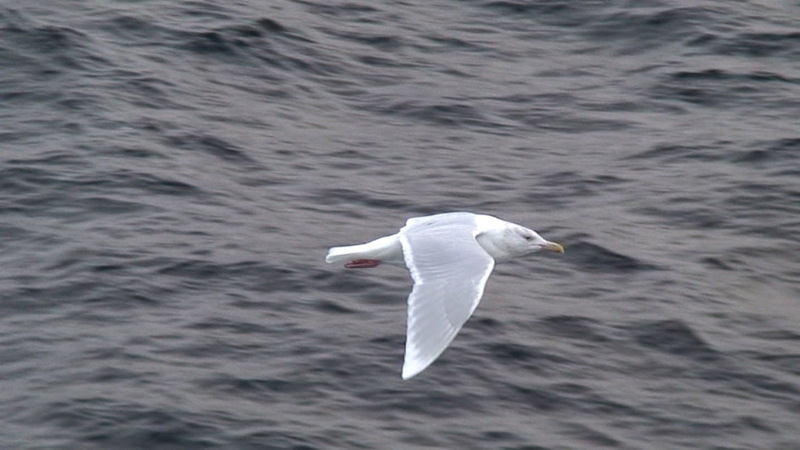 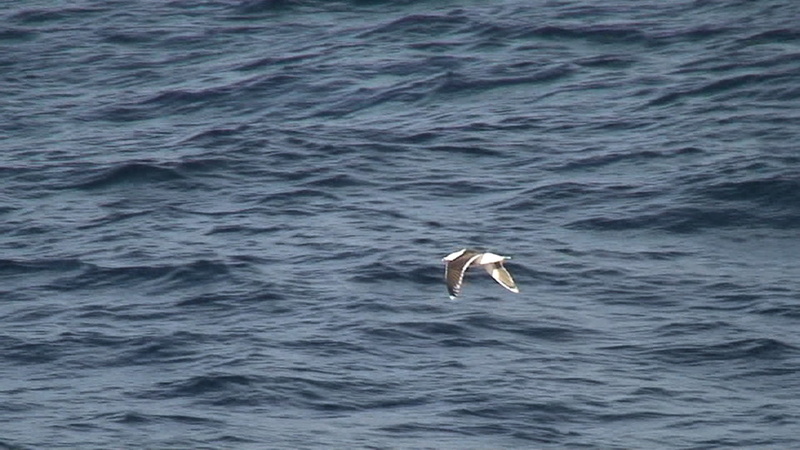 Movie 19 (1:46) Possible Ivory Gull at half speed and 1920x1080 pixels. 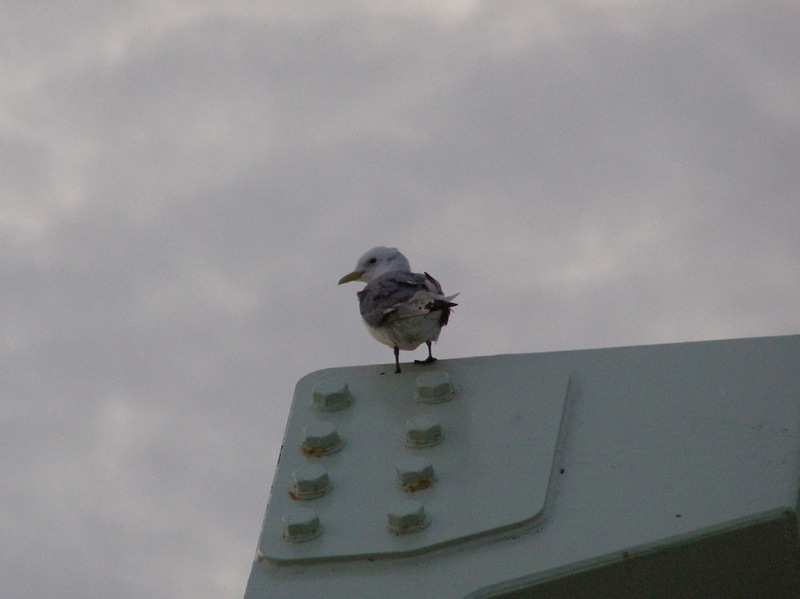 Scroll down to view the photos below. 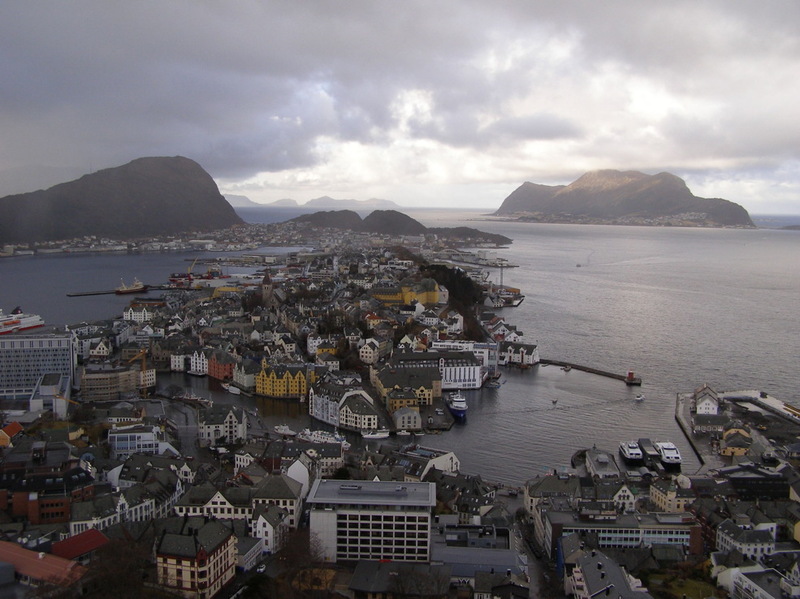 Ålesund from up the hill. 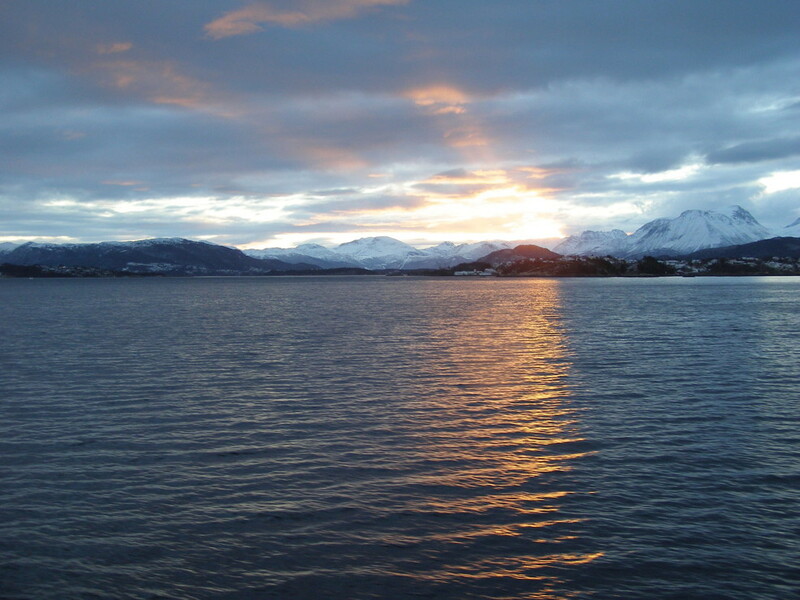 Sunrise on the way out of Ålesund. 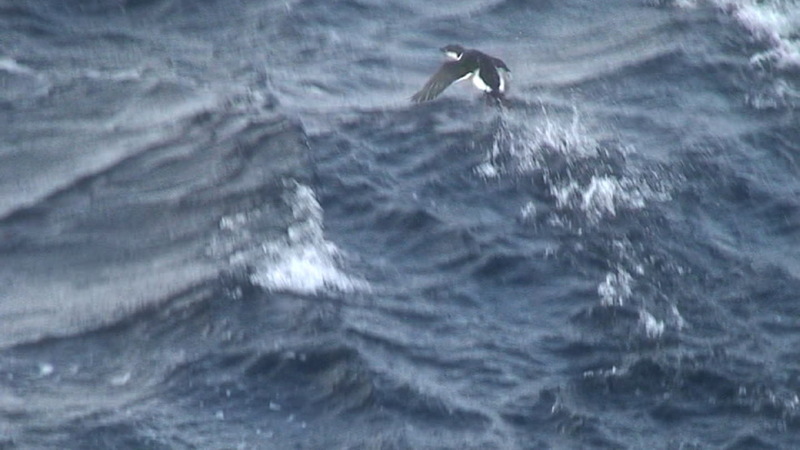 Before this bird submerged, it appeared to be a Murre. 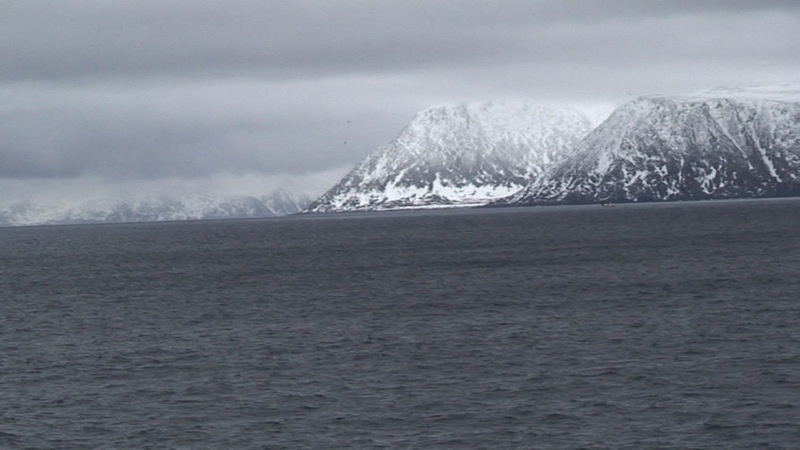 Shortly after crossing the Arctic Circle. 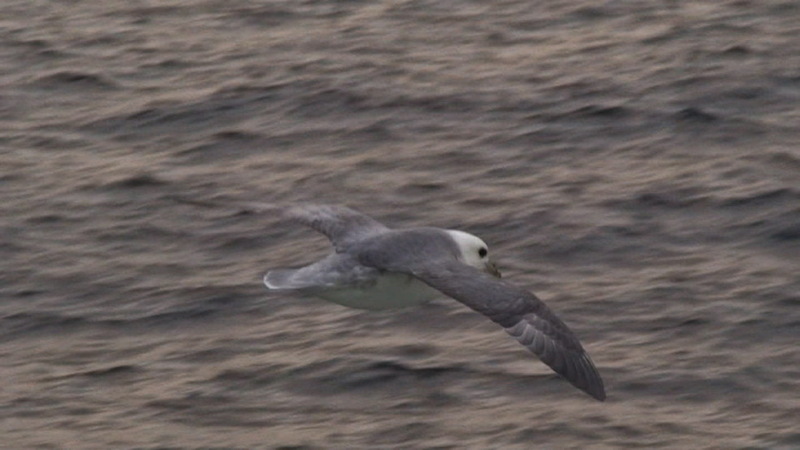 Black-legged Kittiwake in first-winter plumage. 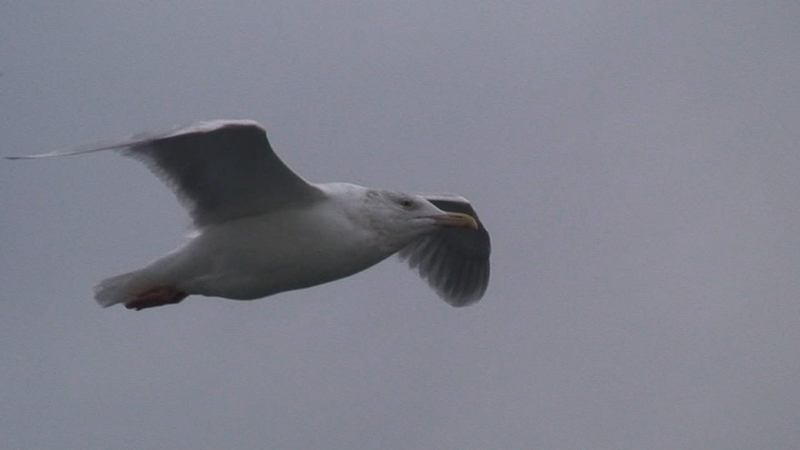 Adult and immature Glaucous Gulls. 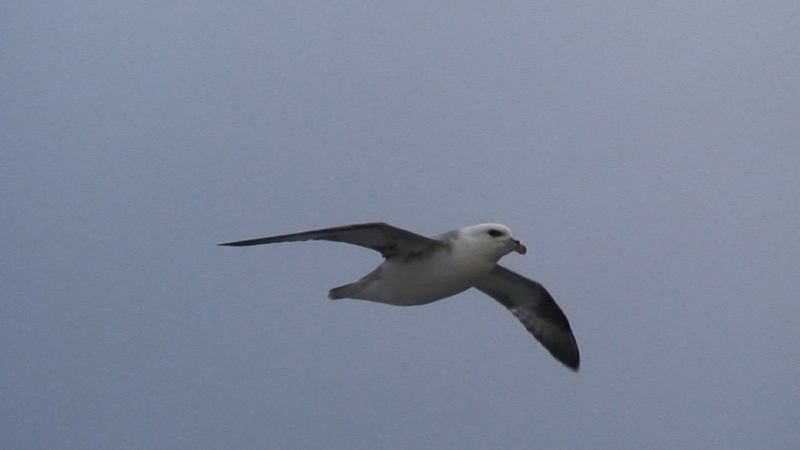 Black-legged Kittiwake in breeding plumage. 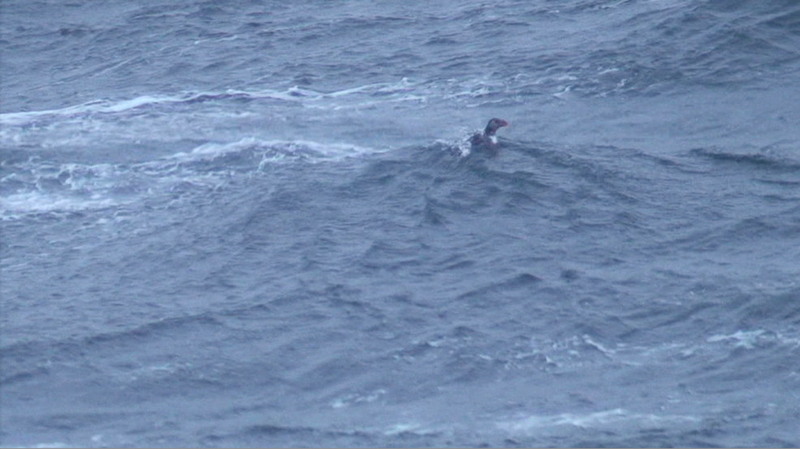 Common Eider (left) and King Eider (right). 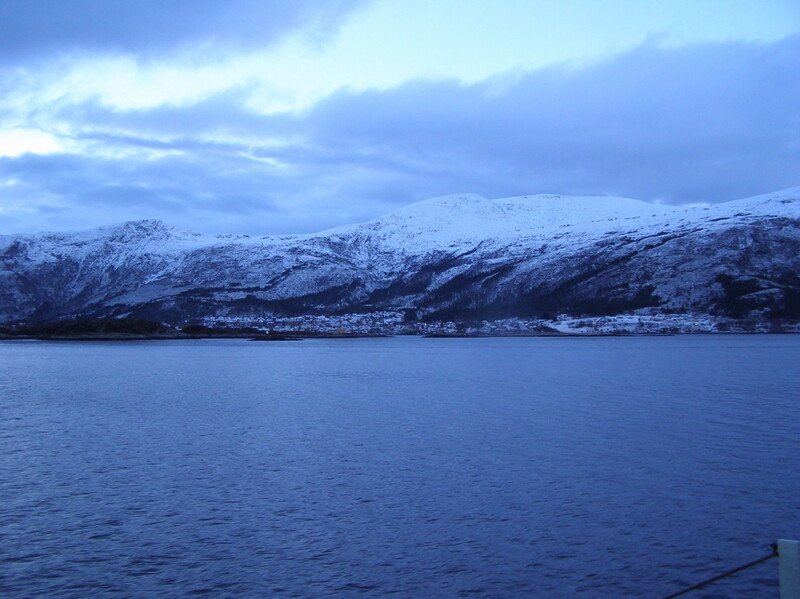 Along the fjord into Tromsø. 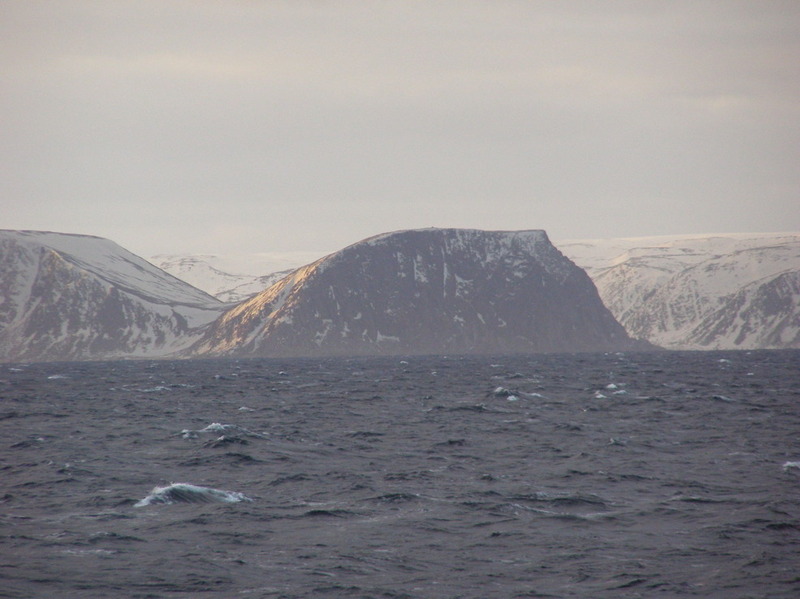 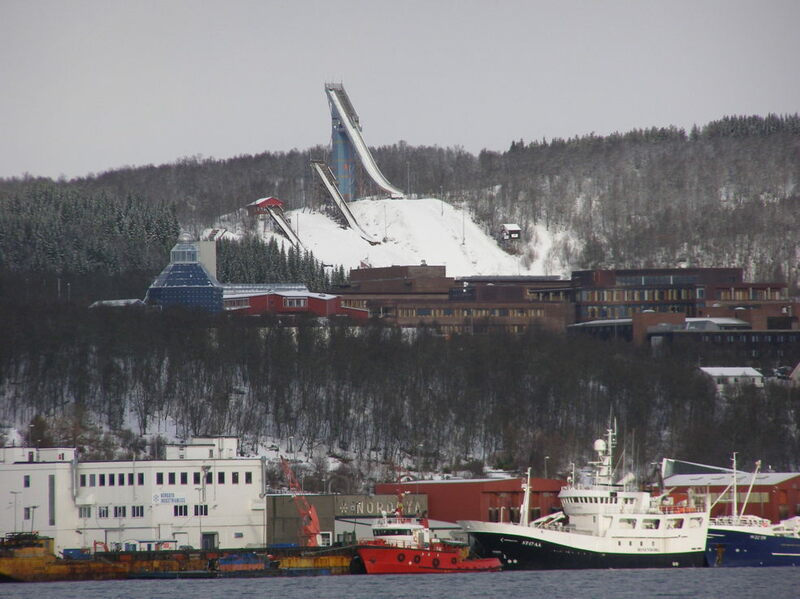 Arctic Cathedral is to the right.